I’ve been home for 3 weeks now and am adjusting back to a non-nomadic lifestyle, although I’ve still put a lot of miles on since my return! I’ve already made 2 trips down to Ohio for some grandma time, and I went up to Marquette for Thanksgiving, where there was a family gathering of 33 people and 6 dogs! On the way back from Marquette we stopped in Petoskey again to visit Taryn (who was on call on Thanksgiving) and Jared, plus I went back up there over this past weekend. I’ve had time to take care of all routine doctor and dentist appointments, plus I took Tula back to the vet. Another blood test shows there are still elevated Lyme disease levels in her blood, so she is back on antibiotics for another month. An X-ray showed the beginnings of some hip joint problems, which is what I noticed after prolonged exercise. It’s not horrible, but good to know what we’re dealing with, and I have pain pills for her when necessary. She seems to be feeling wonderful, and is back to chasing the barn cats and jumping up on the couch and beds (yes, I allow that!). It was fun watching her re-discover her home territory. I’ve had time to see a lot of old friends and went to Ballet Chelsea’s Nutcracker production this weekend, where I saw a whole bunch of familiar faces, and dancers who have grown up so much in a year and a half. As for the next chapter in my life, I am excited to leave for Florida on December 18, where I will spend the next 3 months working for my brother at the Ocala Jockey Club. I will be the winter “office manager” and there are numerous projects going on down there that will benefit from having someone on-site and available around the clock (my brother and his family do not live in Florida). I will be helping with all the comings and goings with 14 townhouses in various stages of renovation and rental; organizing Clubhouse events (first appointment is the day after I arrived, and the first wedding is in mid-January); some farm administration, and even a little horse feeding and turnout – there are also barns and 160+ stalls available for rental – something else to keep track of. And there will be no doubt be a variety of other things going on. An added bonus is my daughter Toni only lives about 20 minutes away, and my dad and his wife will be spending the winter at OJC too. I think I’m officially old because I am not enjoying the cold, wind and snowy roads that are already here in Michigan! So this will keep me busy until the end of March, and then the road will take another turn and I’ll see what happens then! I had very mixed emotions as I began the final day of my journey. I was sad to think that this was the last day of the big adventure, but I was also looking forward to getting home – it’s been 14 1/2 months since I’ve been there. I still had to walk 10 miles and my final 2 donations would be in my hometown of Chelsea, so I had a very busy day ahead. I started off with an early morning walk along the lake in Phyllis’ neighborhood, and Tula and I quickly covered a mile and a half. We had breakfast when I got back and then I heard from my neighbors that the bad storms yesterday had knocked out the power in most of Chelsea, including my house. Restoration was expected to take 4-5 days, so it wasn’t quite what I was expecting to go home to, but they would help me with the generator. Phyllis invited me to stay until the power was back, but it was time to finish my journey, and I didn’t want to postpone things. 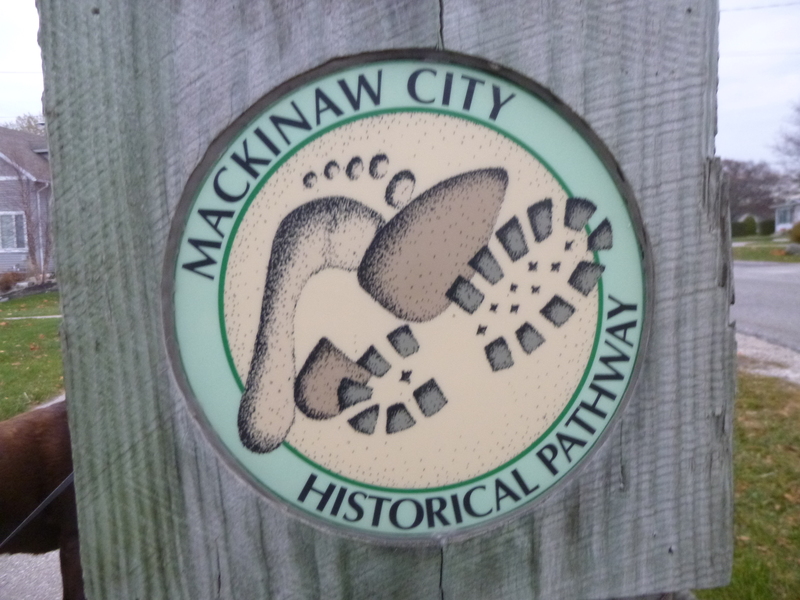 I walked another mile and a half in her pretty neighborhood in the opposite direction, then headed out of Muskegon. 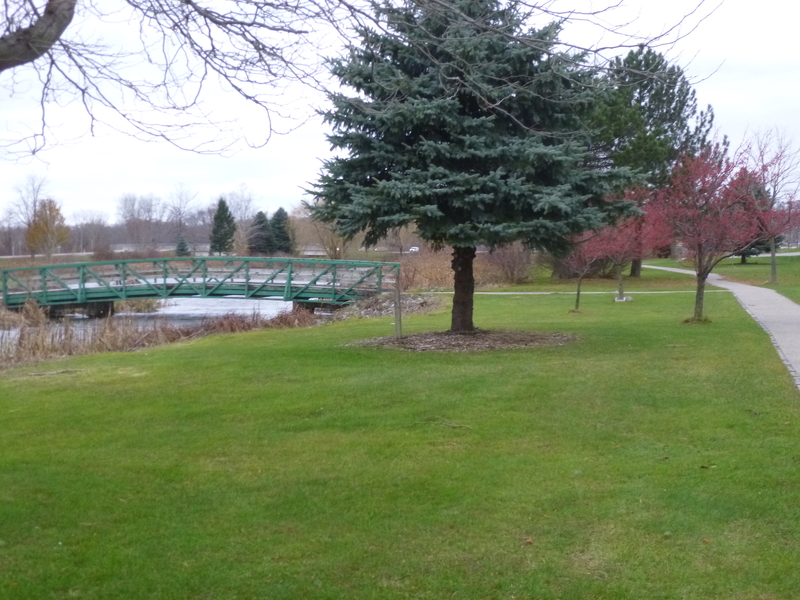 Phyllis had told me about a nice walking path at the local Veterans Memorial Park, so I found that and walked another chilly mile. My very last donation was going to be a food donation to Faith in Action, the local food pantry which was one of the little seeds that inspired part of the journey, and I tried calling them, but there was no answer and I knew they were probably affected by the power outage too since most of the town had lost power (which doesn’t happen very often). I was worried my plans for the day weren’t going to work out, but I kept driving east across the state, getting closer and closer. I stopped and checked a couple more things on the computer, and found out power had been restored in parts of town, and this time someone actually answered the phone at Faith in Action, so I was able to find out what items they needed – feeling very bittersweet that this would be the last time I’d be having a conversation like that. 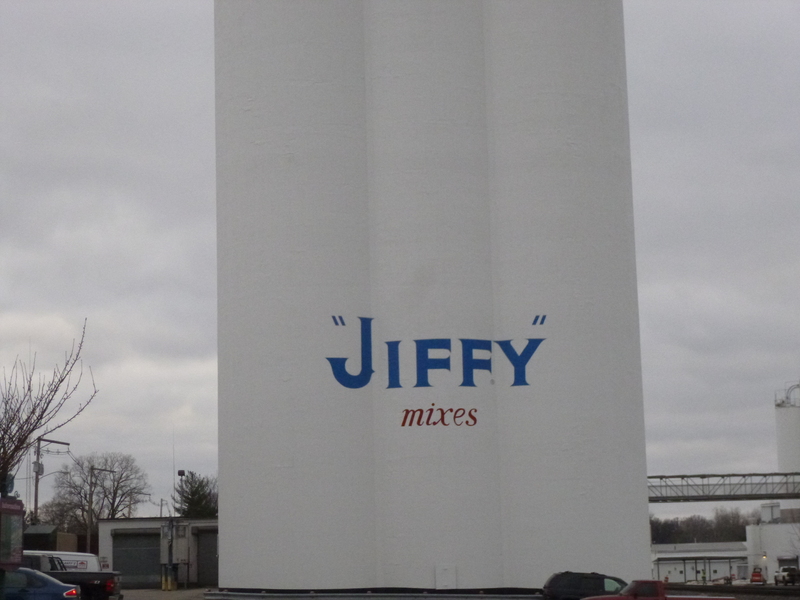 I continued driving and as I got closer and closer to home, I began passing all the landmarks I knew so well. 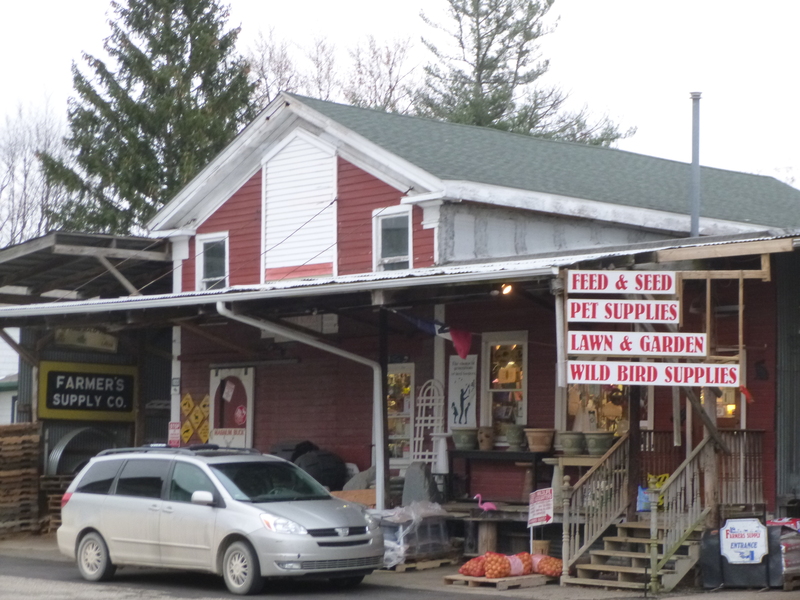 I actually had to drive past my street to head into the town of Chelsea, and by the time I drove by, it didn’t seem possible that it had been 14 1/2 months since I’d last driven down those roads – it sort of just seemed like any old drive down that road. It was fun getting back into town, and I noticed a few changes, but most of it was exactly as it was when I left. My first stop was at my old dance studios, which are housed in the old Chelsea High School. School had been canceled today due to the power outage, but dance classes were going to be running since the power had come back on. 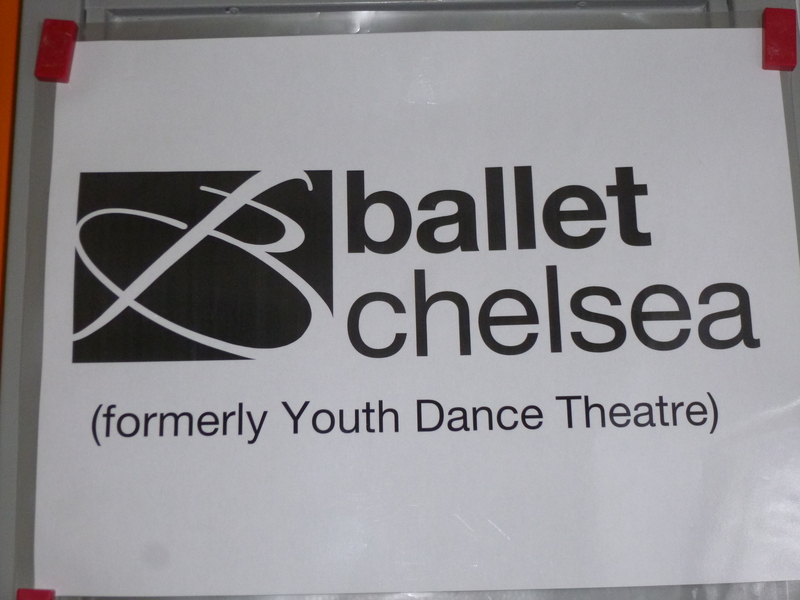 I stopped by to make a donation to Ballet Chelsea (formerly Youth Dance Theatre – they changed the name while I was gone), which is the ballet company affiliated with the studios. No one was there yet, so I was able to just sort of enjoy walking into my old home away from home, only to be surprised by new tile floors in the hallway and new paint – I almost wondered if I was in the right place! 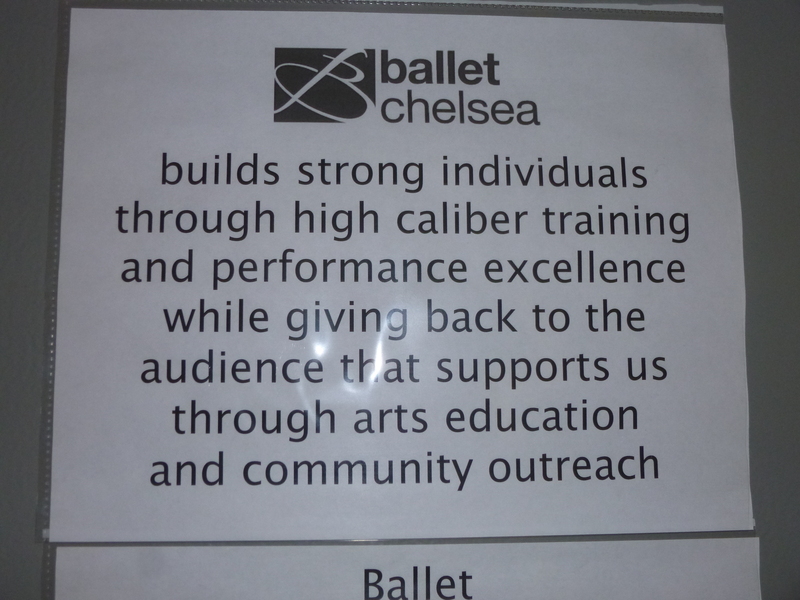 Since I no longer have keys for the place, I slid my donation check under the Ballet Chelsea office door. They are nearly ready for their annual Nutcracker performances, and will be performing Don Quixote in the spring. I was happy to be able to support the organization I’ve been so involved with over the years. 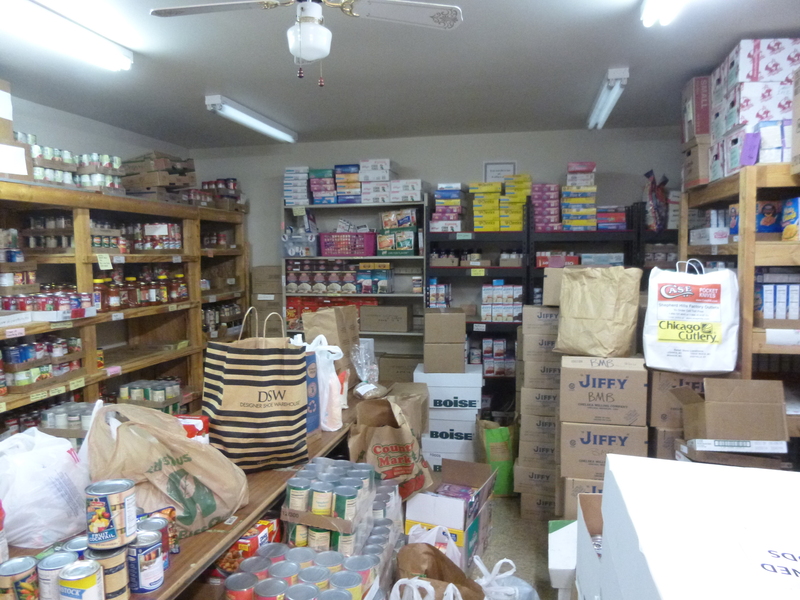 Then it was time to do the final food pantry shopping trip at Polly’s – the local grocery store. Many, many years ago when the kids were young, I had been shopping with the kids, and the local Scout troop was passing out lists of items that Faith in Action really needed. I took the list and I was only able to get 3-4 items on it, and at the time I remember thinking what fun it would be if I could have taken a shopping cart and filled it up with some of everything on the list! And now, many years later, I was able to do just that! It was the perfect way to end the long string of donations, and I got some of everything they had mentioned during the phone call. Never in my wildest dreams all those years ago could I have imagined what I would be doing today. 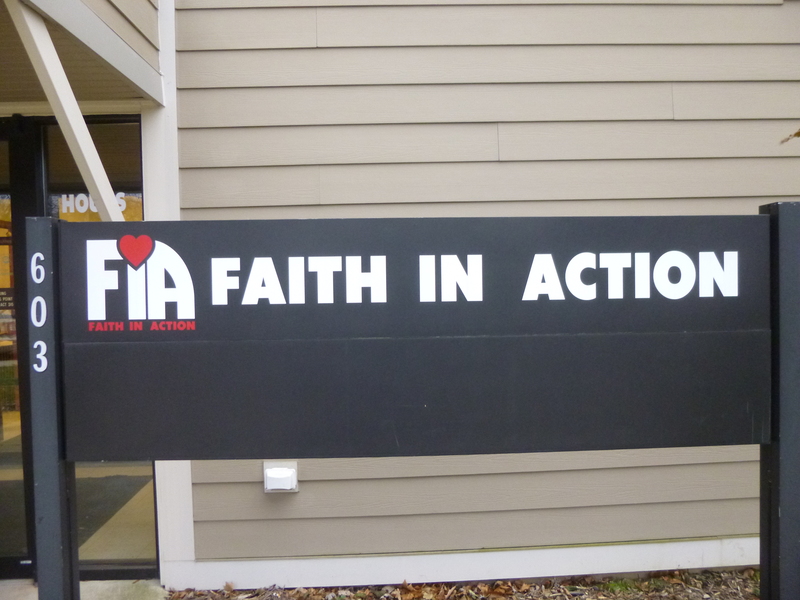 I took the food over to Faith in Action, where they were pleased to get the donation, and were also happy to hear about my story. Unknown to me, the director passed my story on to a news person, who contacted me to get some information about my journey, and she ended up writing a nice article for Chelsea Update. 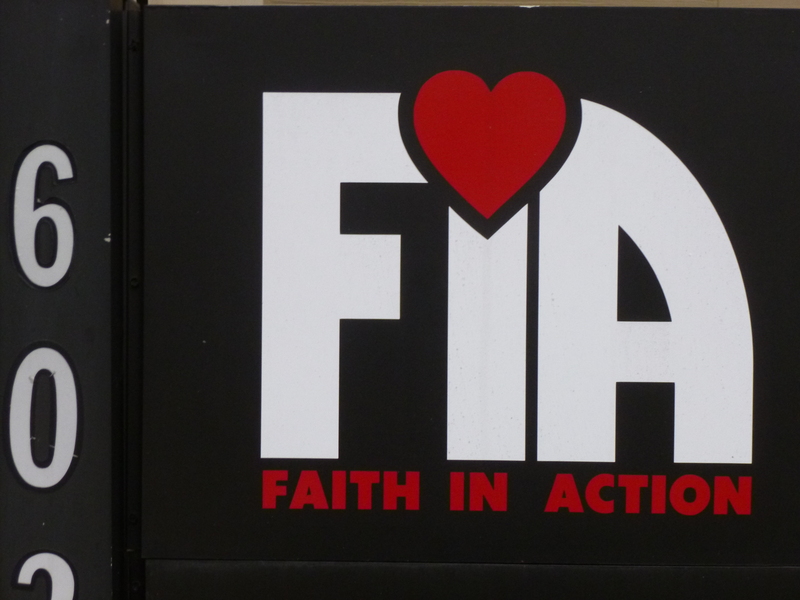 The Faith in Action storage room was pretty full – someone had just done a food drive for them, so they were still sorting things out. 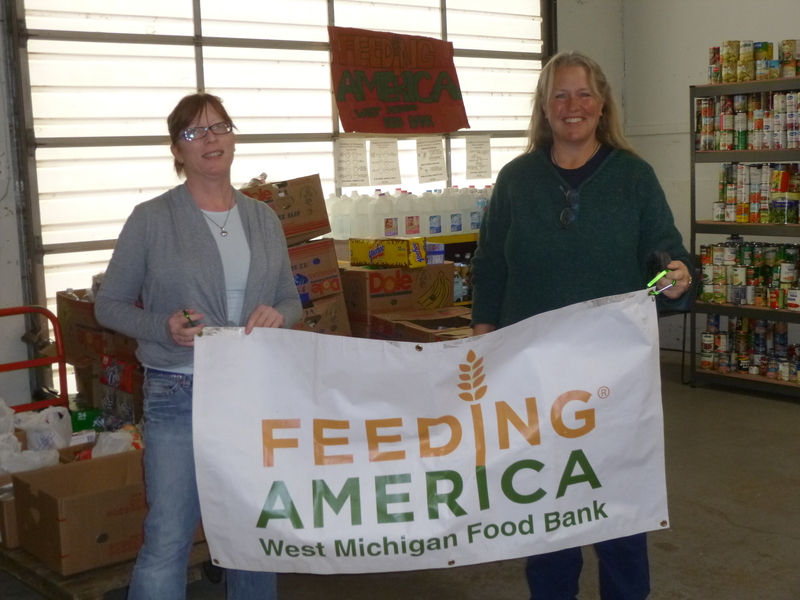 Nancy, the director, told me the need for food assistance has grown dramatically in the 10 years that she has been working there. 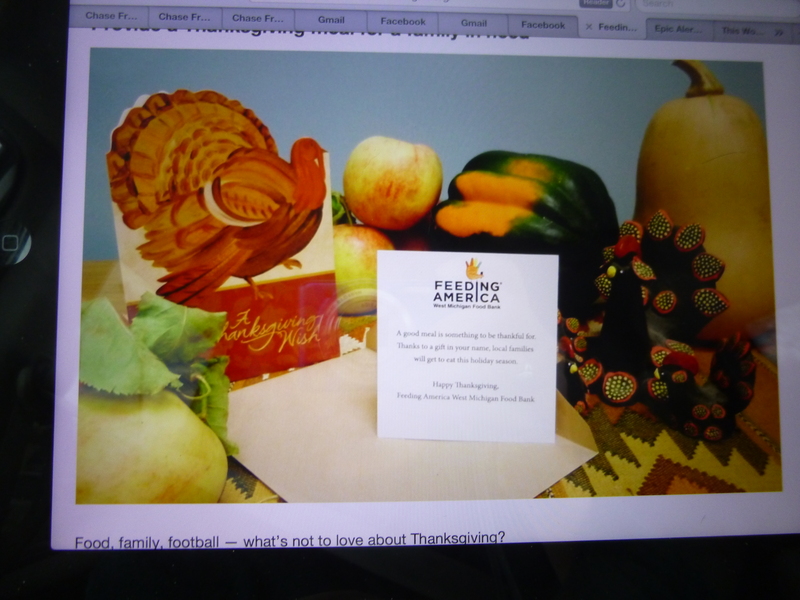 They’re in the process of getting ready for Thanksgiving and Christmas events, so they were pretty well stocked, but Nancy told me that once February rolls around, the shelves would be pretty empty. And that was something I heard at a lot of places. People are very generous during the holiday times, but they tend to forget about food pantries and soup kitchens the rest of the year – the need exists year-round, not just in November and December. And with that, the donations for Michigan, and the entire journey, were complete. 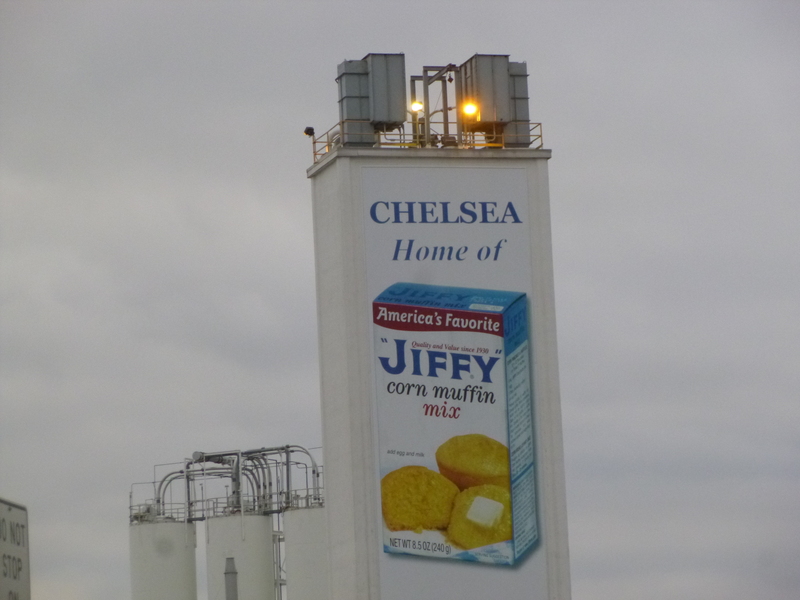 I still had nearly 6 miles to walk, and Tula and I set off for 3 1/2 miles of walking all around town – down Main Street and along all the familiar streets and shops, and into the familiar neighborhoods, and past the landmarks that Chelsea is known for, like the clock tower and the Jiffy Mix grain elevators. I really enjoyed being back in the town I know so well. 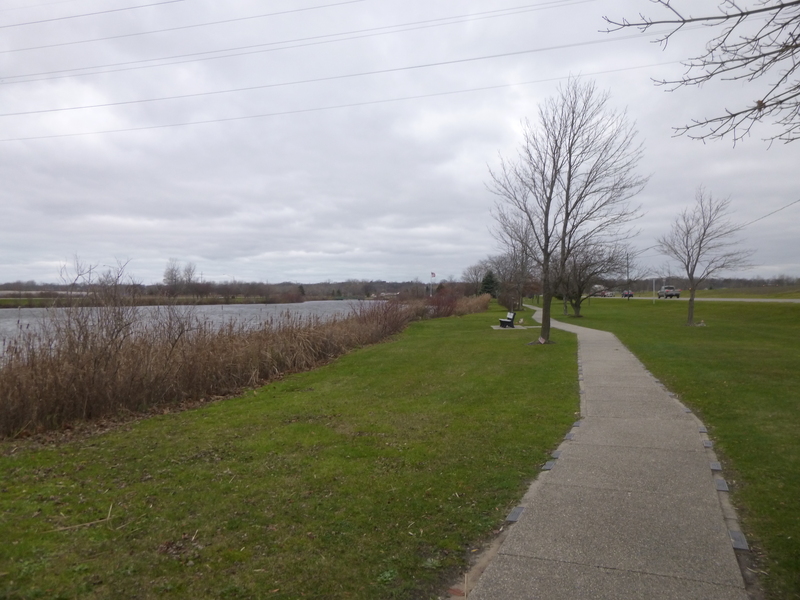 I saved the last 2 1/2 miles of walking for the horseshoe-shaped loop by my house that I’ve walked countless times – I wanted my last walk of the journey to be by my house. It had gotten dark while I was walking in town, and it was really dark when I pulled in my driveway because the power wasn’t on in the outlying neighborhoods. My neighbors Lynn, Mike and Ciara were in the driveway to meet me, and it was awesome to see them again – they’ve been a huge support in my journey by looking after things at home. 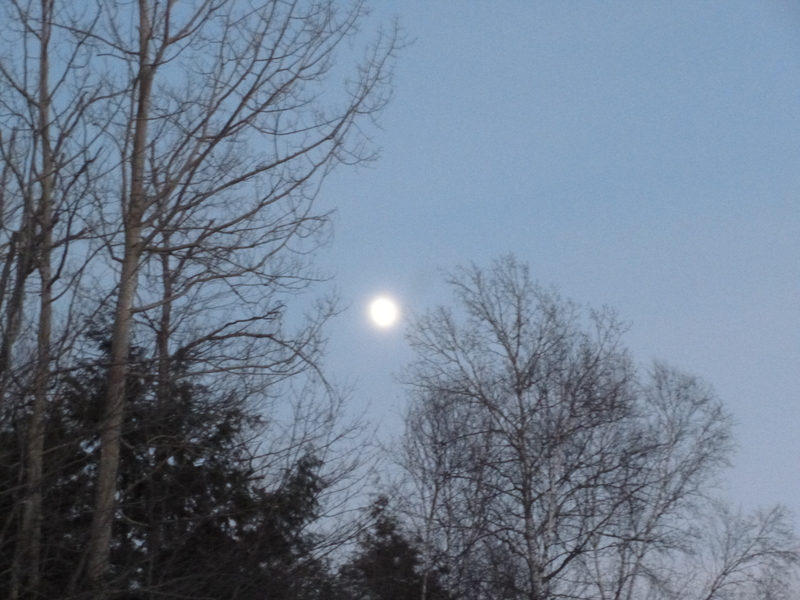 They helped me get the generator going, and then I set off on the final walk of the journey – 2 1/2 miles by moonlight on a road that I know nearly every inch of. Tula seemed to be really excited to be back – she was running back and forth on the street sniffing everything in sight. And then after 45 minutes I walked back into the driveway – home safe and sound, with the journey successfully completed. It was over – an amazing adventure that I will continue to soak in as I move forward with whatever I’m going to do next. 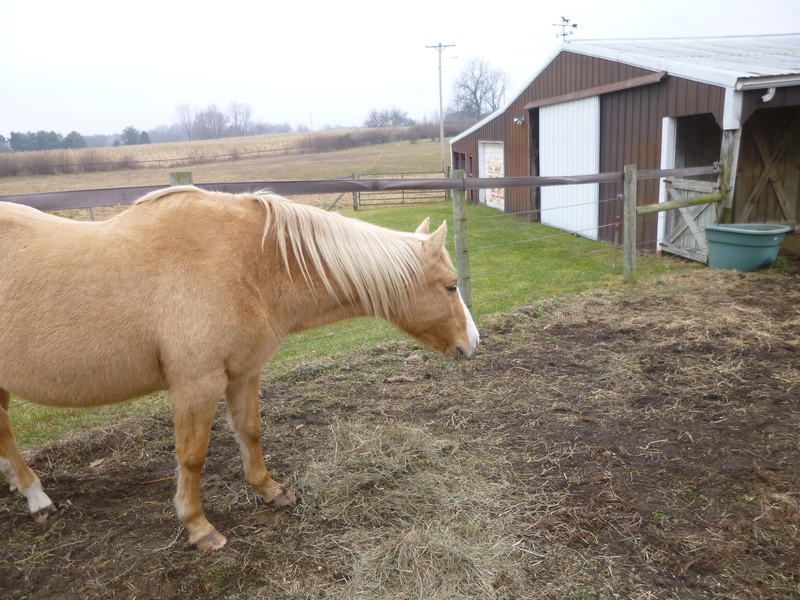 I went down to see my fat old horse Misty in the barn, and then slowly began to carry in a few things – scarcely believing that I won’t be researching donation opportunities and looking ahead at the map for the next state. Monday nights usually involved pulling out the map for the next state, and starting to get an idea of what I might do, but now there are no states left. I’ve been to them all! I knew dance classes were over at 9pm, so I headed into the studios since I had always enjoyed Monday nights after class catching up with the instructors. I didn’t know what classes were in, but as soon as I turned the corner, I saw lots of the older dancers who had grown up so much in the last year and a half, and it was almost overwhelming seeing all of them, and their parents and the instructors. In a way it felt like I hadn’t been gone that long, but on the other hand, I could see the changes, and life moves on. I missed the people there, but I didn’t really miss the work, so I know I’m ready for something else. After visiting for a while, I headed home and the house had warmed up a bit, and I had some light thanks to the generator, so after 444 days on the road, I was back in my own house in my own bed. I had walked 3136 miles in 56 states and territories, and made 392 donations – and a warm, fuzzy feeling came over me knowing I have helped people in some way literally all over the country. It was kind of hard to believe – the calendar on the kitchen wall was still open to August 2012, and for a moment I wondered if it could have all been a fantastical dream. But it’s wonderful reality, and I have memories for the rest of my life. This particular journey has come to an end, but it’s not the end of the road – there will be something waiting around the next bend, and, like I’ve done for the past 14 1/2 months, I’ll simply see what the next day brings. It was time to get packed up to set out for the last 2 days of my journey, so after Taryn and I had breakfast I got the van loaded up and the weather was not looking good. Despite that, I had made arrangements with my friend Jan to do a little walking in Boyne City together, and her mom joined us too. 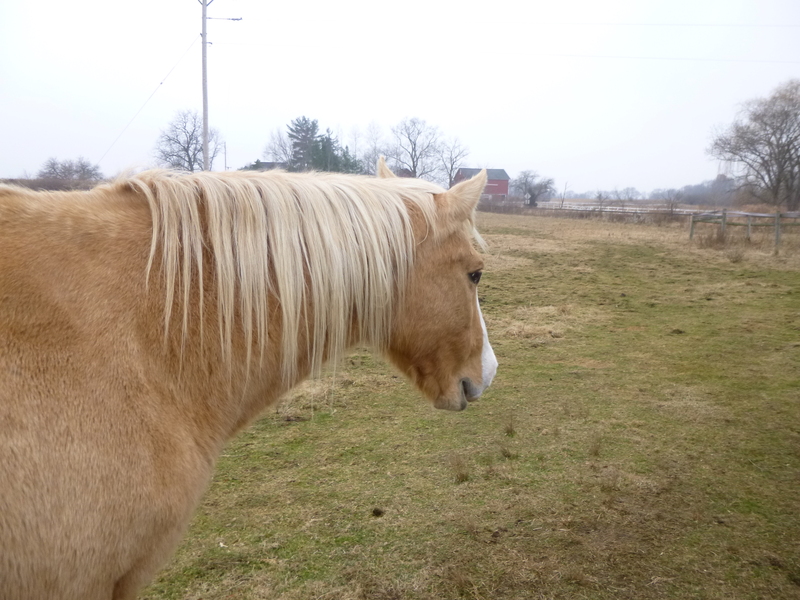 We dodged the raindrops and covered about a mile and a quarter without getting too wet. 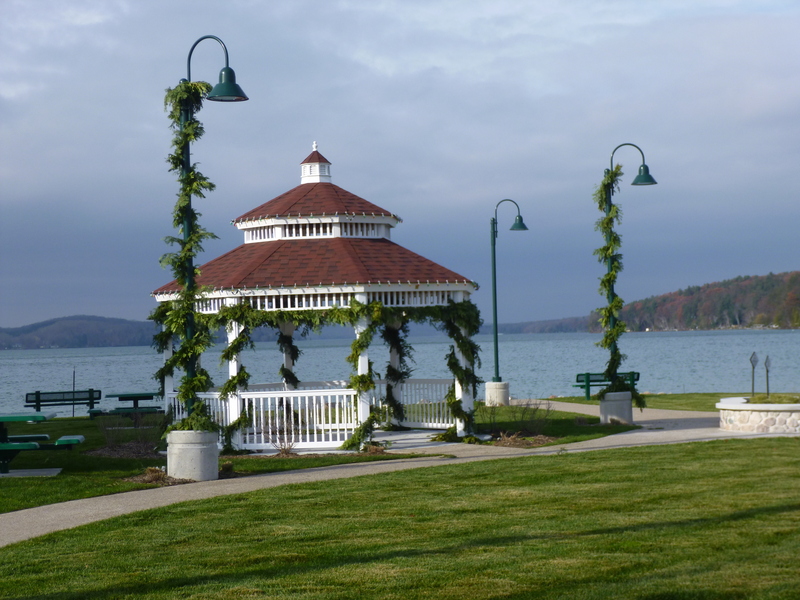 I went back to their place on Lake Charlevoix, which I had visited numerous times up through our college years – and parts of it looked exactly like I remembered. It’s such a pretty part of the state. We visited for a while there, and warmed up with some hot chocolate, then I set off. 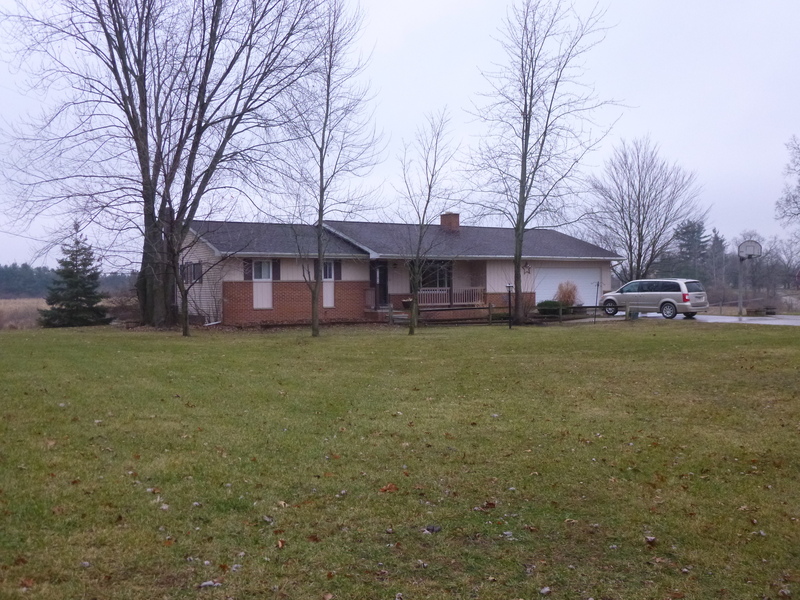 My destination today was my aunt Phyllis’ house in North Muskegon, so I had a bit of driving to do and I wanted to fit in as much walking as I could. 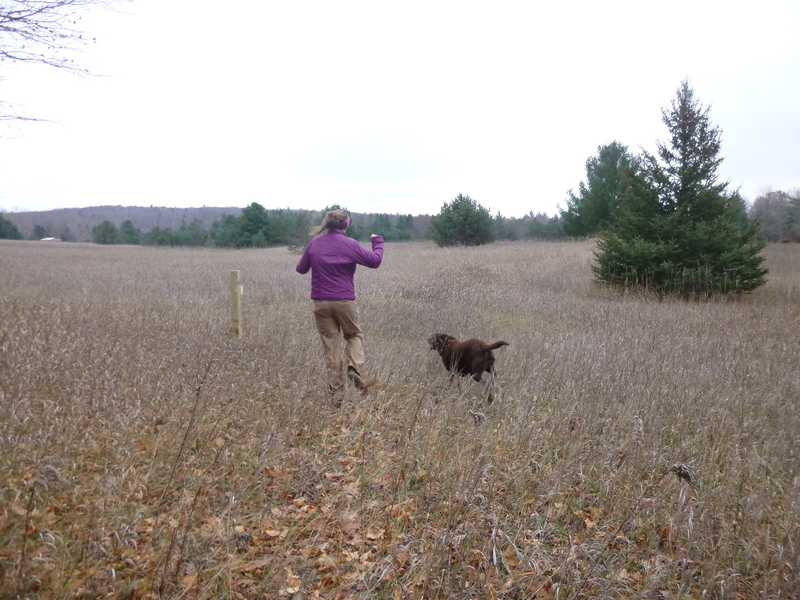 I passed through Charlevoix again and since the rain had temporarily stopped, I got Tula out for a walk while I could. When we were about 3/4 mile away from the van, the clouds opened up and it didn’t take long at all to get absolutely soaked. I had a rain jacket on, but no umbrella, and soon even my shoes were squishing out water. Tula had to stop and shake several times. I dried her off quickly as best I could when I got back to the van, but it was pretty hopeless and there’s nothing like a wet dog shaking herself off inside a vehicle! I wasn’t even able to get any pictures today because it was just too wet to take the camera out! I made my way slowly through the heavy rain until I came to Elk Rapids, where the rain let up a little bit, so I grabbed the umbrella and left Tula in the car and walked only about a half mile before I decided I didn’t want to battle the wind with the umbrella. So I went back to the van and set off toward Traverse City. It was pretty slow going because the rain was coming down so hard. It was even beginning to thunder and lightning a bit. 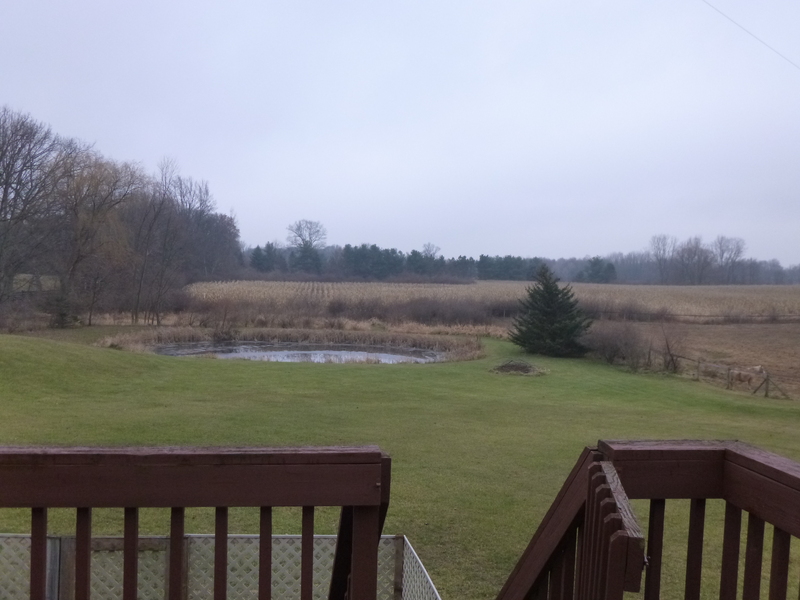 I turned the radio on and listened to all the bad weather news – 60+ tornadoes in Illinois and then rolling on through Indiana and Ohio, and some torrential rains and wind in Michigan; some of which I was coping with now. This was some of the heaviest rainfall I’ve encountered during the whole journey. I finally made it to Traverse City, and I was worried about driving through some of the intersections because they were so flooded with rainwater. I watched other vehicles go through the intersections while spraying up big roostertails of water. 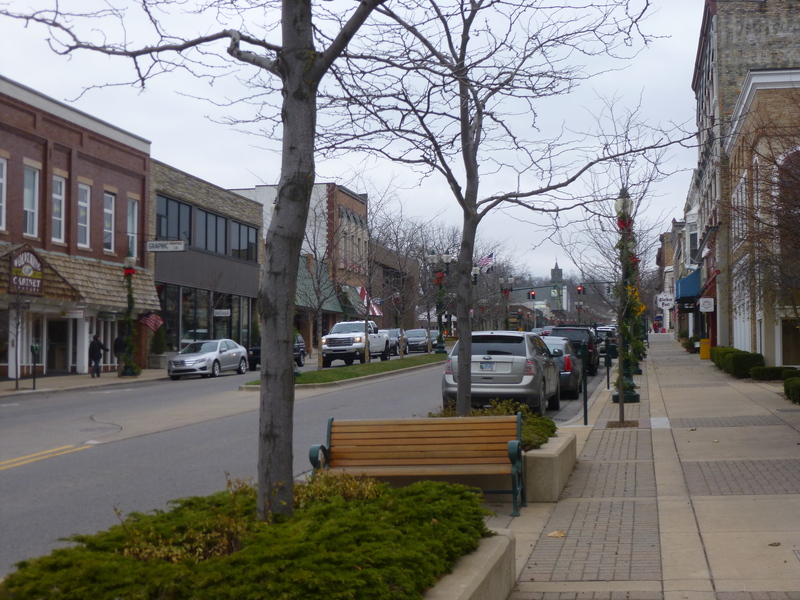 I drove through downtown Traverse City and was disappointed it was such a bad day to be outside because it looked like a fun town for walking. Since I was already pretty wet anyway I decided to get out for one more mile of walking in the downtown area, where there were a surprising number of people out in the wet weather. It helped that there were a lot of overhangs and awnings. By then I’d had enough rain and was feeling a bit chilled, so I got into some dry clothes and shoes and stopped walking for the day – I was only able to cover 4.7 miles, but felt lucky to get that much in. I’ll have a few extra miles to walk tomorrow. Once I was warm and dry, I finished up the slow, rainy drive to my aunt’s house, and it was incredibly nice to walk in the house and smell a yummy dinner waiting! We had a wonderful roast beef feast, and spent the evening visiting. I think it was good for me to be ending this final week seeing a lot of family, because it helped with the transition of a wandering life on the road back to a more normal life back home in Michigan. I could sort of pretend I was just driving back from one of the countless trips I’ve made up north. But there was still one big day to go! Taryn and I headed out for a short walk to the bakery right by Walloon Lake and had enormous cinnamon rolls for breakfast (deer season opened yesterday and Jared was out hunting with some of his family, although he got his deer by 7:15am yesterday morning), then we took Tula on a river walk near the little town of Walloon Lake. We passed a sign that explained Ernest Hemingway’s family had a summer cottage in Walloon Lake so he spent a lot of time in the area, and the people he met often influenced his writing. 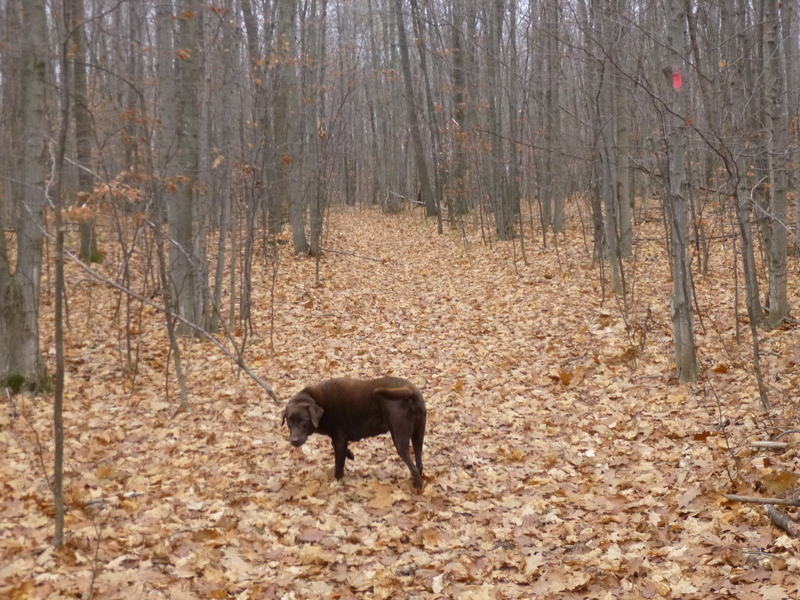 Taryn and I walked all over the place near Walloon Lake and up into the hilly neighborhoods – we covered almost 4 miles before walking back to her cabin. 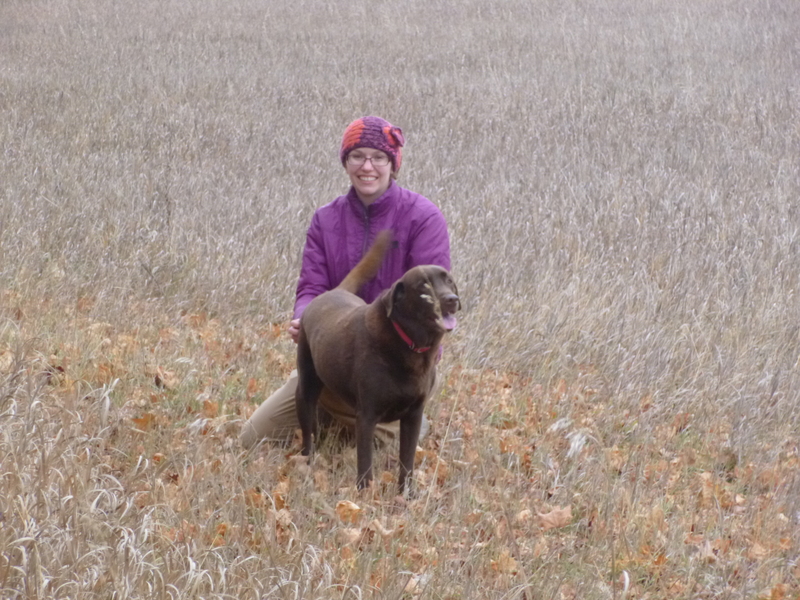 Then we went over to some woods and fields that are part of a big nature conservancy program and walked another couple of miles with Tula on the paths through the woods. From there we headed into the picturesque town of Petoskey and walked another 3+ miles all through town and out into more historic neighborhoods. 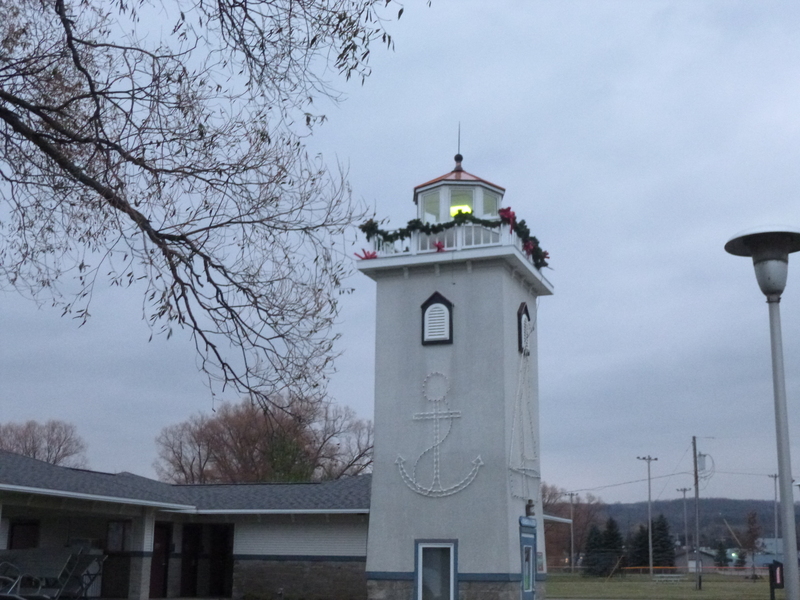 Petoskey was being decorated in its Christmas finery and it was a pretty town to walk through – there were lots of people out and about doing some shopping. 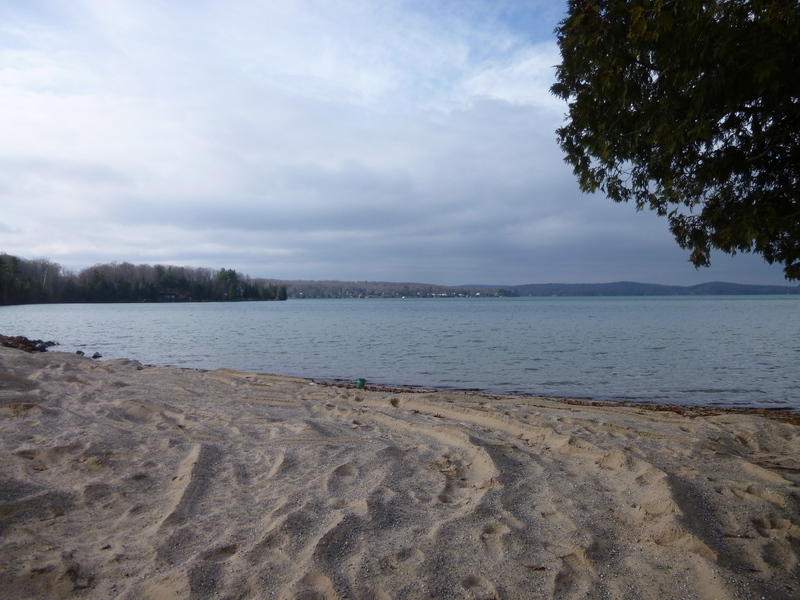 By then we had worked up an appetite so we went back to Walloon Lake to a water-front restaurant that had just opened during the summer – they even have docks right outside so people can park their boats there. In the summer the glass walls open up to the lake and fresh air, but they were closed today of course. The waterfront views were still pretty – and who knew brussels sprout/bacon/cheese appetizers could be so good?!? I won’t be making a donation this weekend since 5 of my Michigan donations are done, and the last 2 will be in my hometown of Chelsea on Monday, which will be the final day of the journey. I’m trying not to think about that! Taryn and I still wanted to do a little more walking today, so we drove back to Boyne City to walk a couple more miles in that town by daylight. That gave us a total of 10 1/2 miles of walking for today, and with that accomplished we went to see the movie Gravity and enjoyed some good popcorn to cap off the day. I got an email this morning with news I’d been hoping to hear. 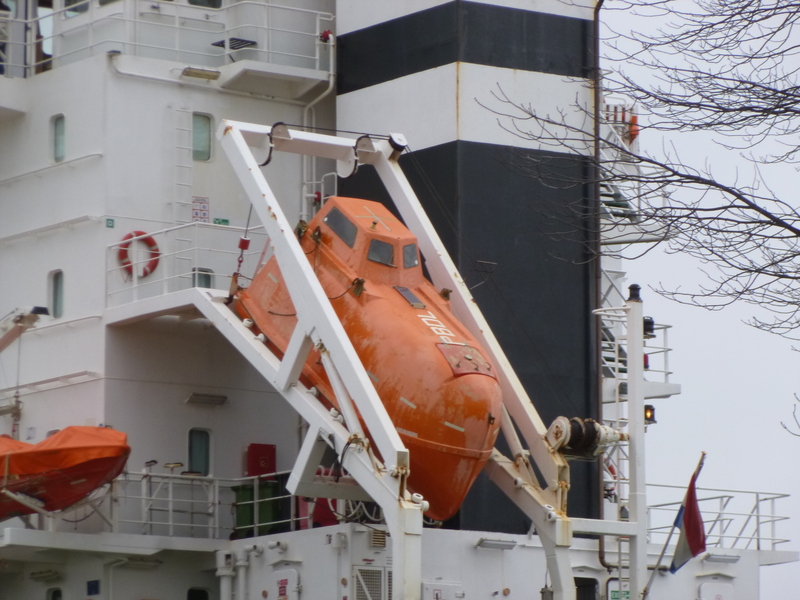 It came from an officer on the Coast Guard ice-breaker Mackinaw, and it was letting me know they had checked with their legal department and would be able to accept my donation for the Coast Guard Family Christmas Party. 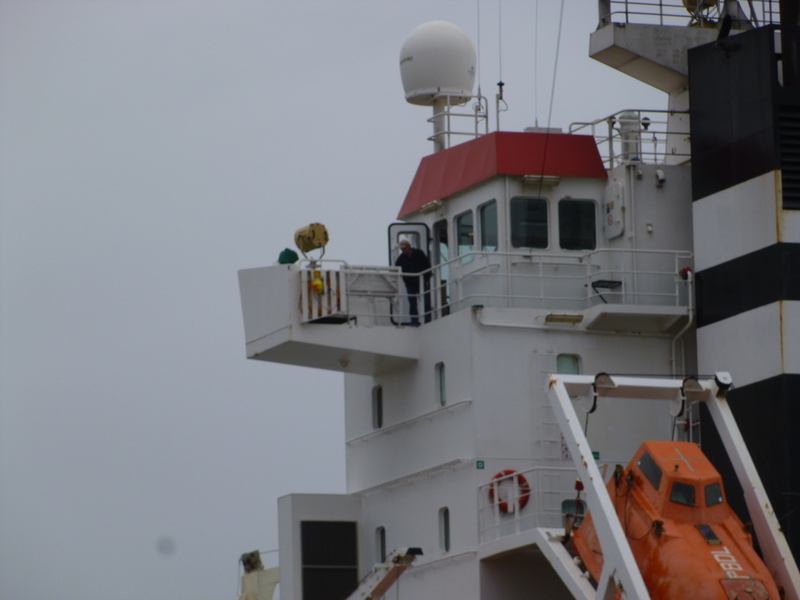 My communication with them had started a few days ago – it had occurred to me that despite all my military-based donations, I still hadn’t made one to the Coast Guard. 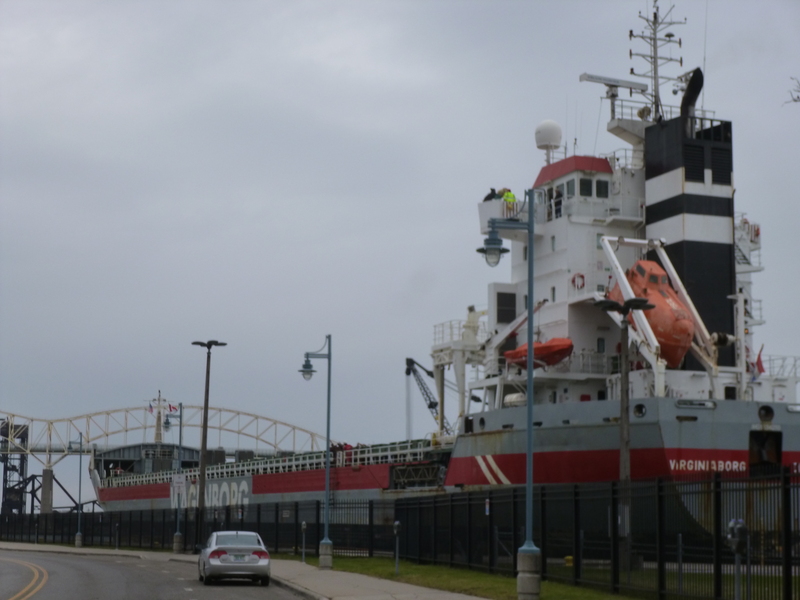 The “Mackinaw” is a heavy-duty Coast Guard ship based in Cheboygan, Michigan and in addition to its ice-breaking duties, the crew also assists with buoy cleaning and repair, search-and-rescue missions, maritime law enforcement and other duties. 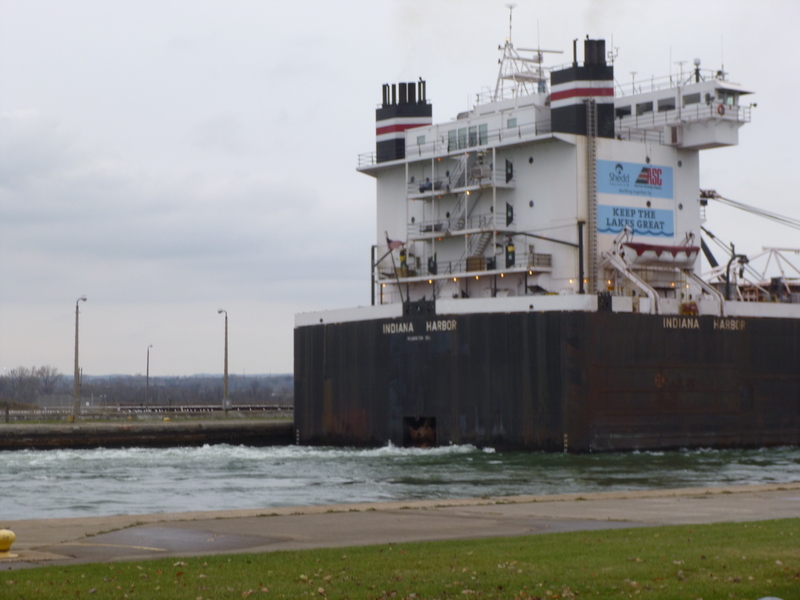 (This weekend it becomes the Christmas Ship – delivering 1200 Christmas trees to Chicago as part of a maritime tradition that began in the late 1800s, and also dropping a wreath in the water where a Coast Guard ship sank in 1912 during a bad storm.) 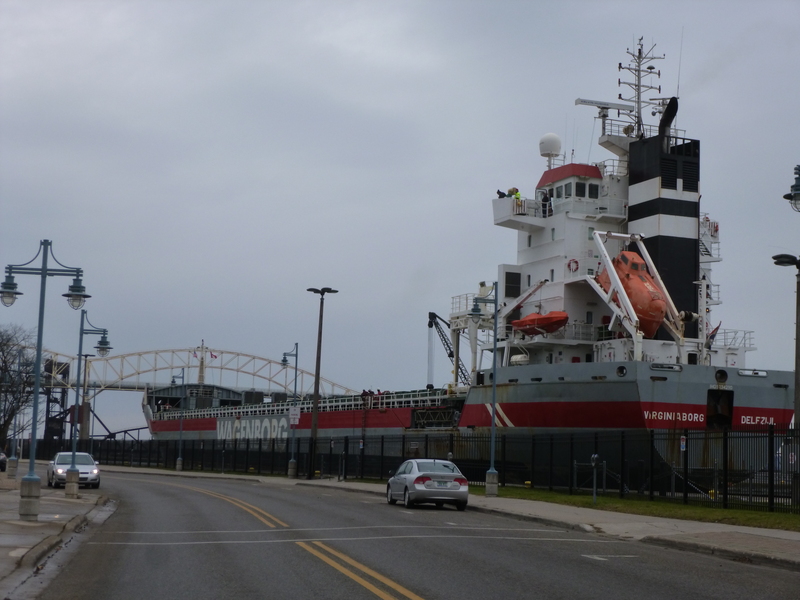 When the Mackinaw is in port, visitors are welcome to tour the ship, but the weather had delayed the ship’s return to port today so I wouldn’t be able to visit it. In an effort to contact them about making a donation, I had read what I could find on-line, then sent an email to the ombudsman with a short explanation about what I was doing, and why I would like to make a donation to them. They apparently forwarded my email to an officer on the ship, who called me yesterday and told me he thought my journey was really “neat” and that he would have to get legal clearance to be able to accept the donation (kind of the same thing I ran into back in Yorktown, Virginia) and he would do what he could to obtain that. And then I got the email this morning that they could indeed accept it for the Coast Guard family Christmas party, so I was happy about that. I’ll just mail the donation in since I can’t visit the ship, but he gave me the address. I had another visit to make to start off my day. Taryn had to work til 3, but I had been talking with one of my oldest childhood friends who now works for the Bergmann Center in Charlevoix. 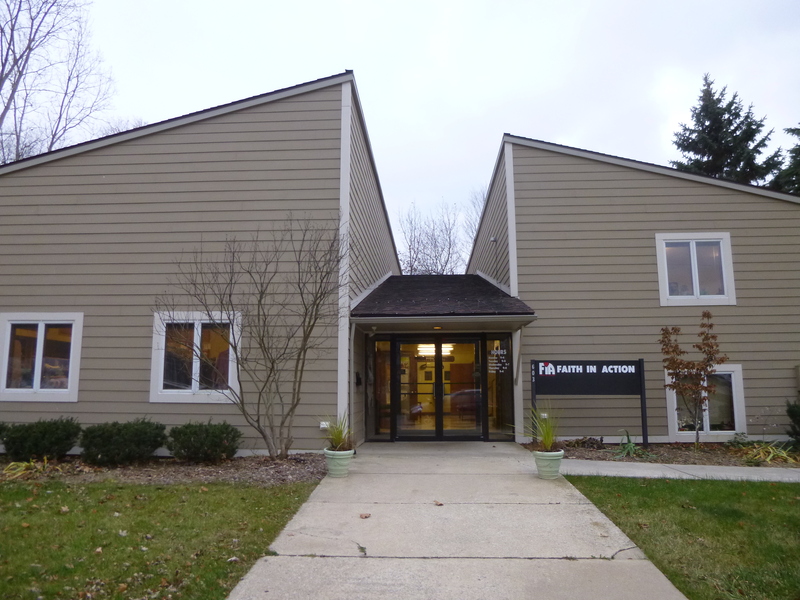 The Bergmann Center is a place for adults with developmental disabilities, and many of them run little businesses (making jewelry, dog soap/shampoo, fire starters, rock painting etc) and they sell some of their things at the Bergmann Center thrift store. They had occasionally been following my blog, and my old friend Jan had asked if I could stop by to talk with them for a few minutes and answer some of their questions. So I stopped by and it was fun to meet them – they were an enthusiastic bunch and had a lot of questions. 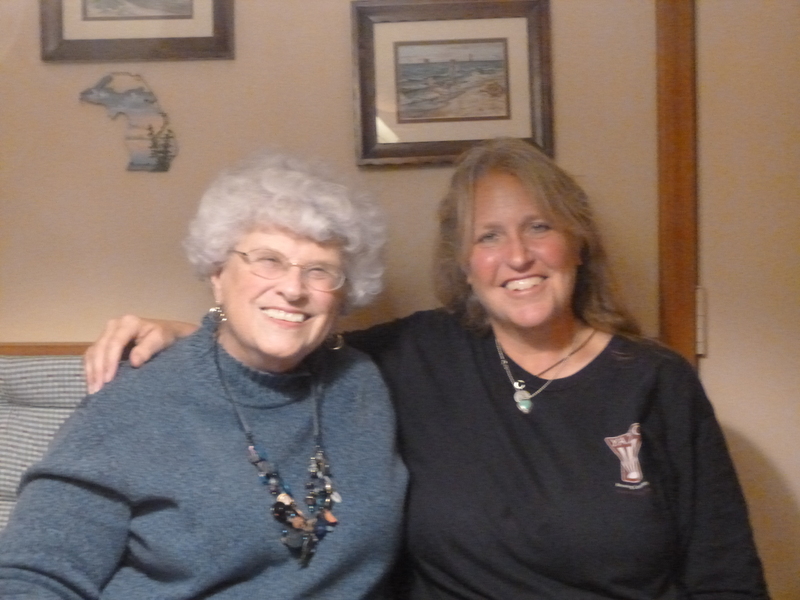 My friend Jan’s mom was also there, and it was fun to see her again after about 30 years! Some of the clients gave me some things to pass on to other organizations, and Tim, one of the employees, actually gave me $56 to forward on to a good organization (a couple days later I gave Tim’s donation to the Kids Food Basket in Muskegon; a worthy organization that my aunt Phyllis often helps with – I wrote a note with the extra donation explaining who had made the donation). Some of them wanted to meet Tula since they had read about her too, but Tula was kind of shy and only met a few of them outside. 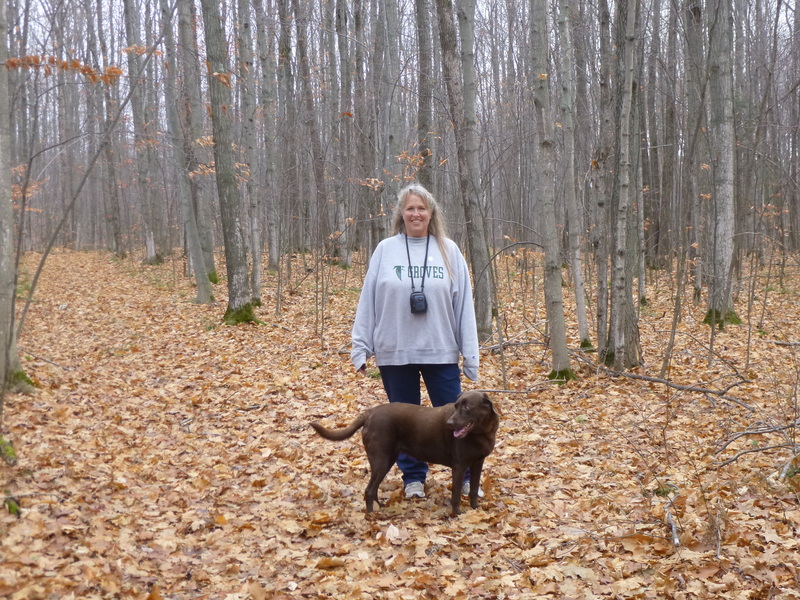 When I was finished at the Bergmann Center, Tula and I set out for a walk in Charlevoix. This is such a pretty part of Michigan! 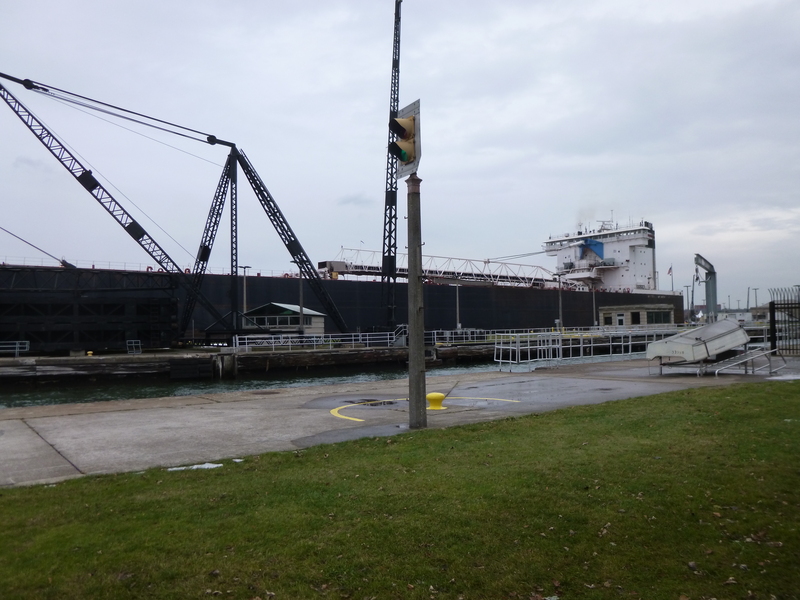 We passed a drawbridge that was opening up for the Beaver Island ferry and walked out on the breakwater. After a mile and a half, I put Tula back in the car (one of her legs seems to be bothering her a little and I don’t want to push her), and then set off for another 3+ miles of walking all through town and into some of the historic neighborhoods with grand old houses. 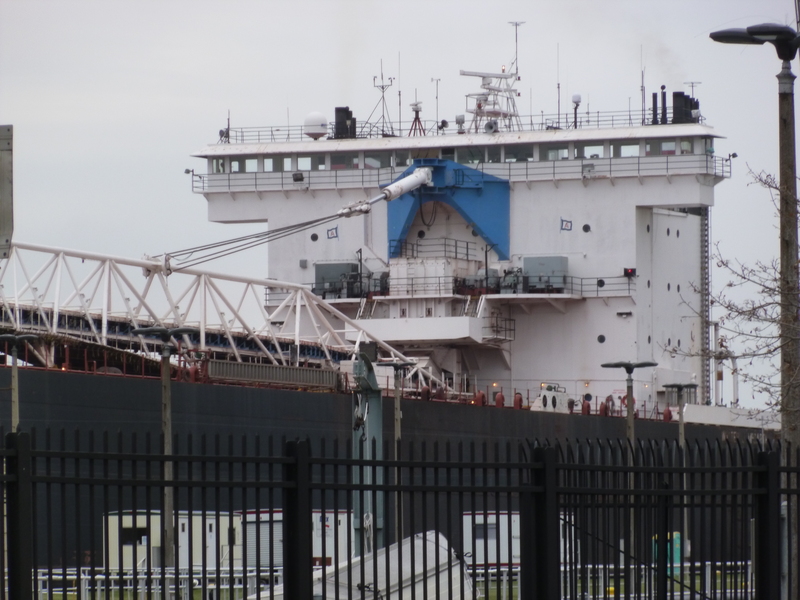 The docks were pretty empty – most of the boats were in winter storage, but there was at least one hardy soul who took their sailboat out, and the drawbridge opened again for them to sail out onto Lake Michigan from Lake Charlevoix. Jan and a couple of the clients tracked me down in town near the water so that I could meet one of them who hadn’t been at the center in the morning. Then I made my way back to Petoskey – Jan had given my name to one of the reporters for the Petoskey paper and we had arranged a time to meet for a short interview. When I was done with that, I met Taryn at the hospital and she gave me a tour of the place, although of course I couldn’t go inside the operating rooms. It was fun to see where she works. After she changed out of her scrubs, we set off for a walk on the Little Traverse Wheelway along Lake Michigan. We walked almost 3 1/2 miles and went out on another breakwater to see the lighthouse. Then we had appointments for pedicures, and after that we drove to the ski lodge in Boyne City to enjoy their Friday night special – an all-you-can-eat prime rib dinner that was absolutely amazing, and I had seconds! 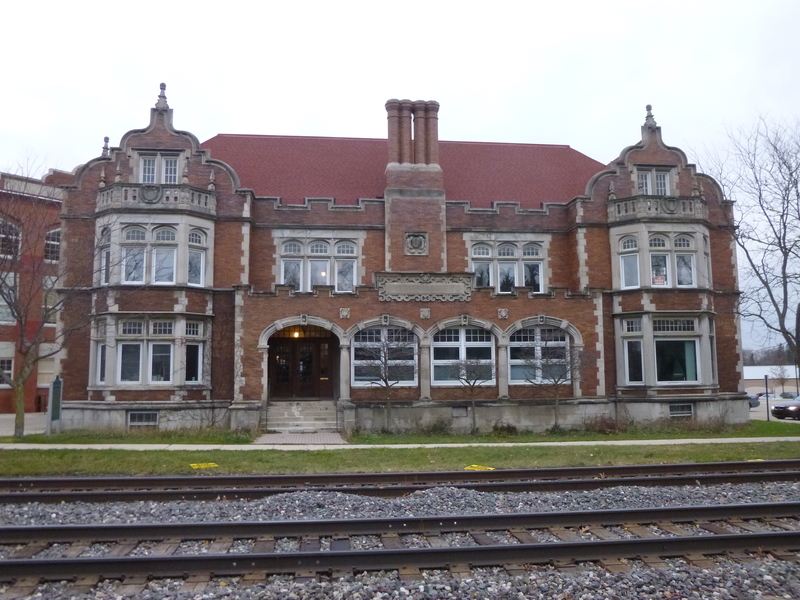 It was fun to look around the lodge, and imagine it all full of chilly skiers warming up in front of the fireplaces. It was a nice way to end a very full day! I used some points for a free stay at a motel last night, and that was the final motel stay of the journey – I’ll be with family for the rest of the Michigan week. I ended up in Sault Ste. Marie last night, which is the oldest city in the state, so I wanted to make a donation here. At first I thought I was going to make a donation to Sleepover 2013 – an overnight campout in cardboard boxes (that can be decorated!) to support the local Soup Kitchen Community Center. But I couldn’t find the place even though I drove up and down the street several times. I called them and explained I’d like to make a donation but I couldn’t find the right building, and after a bit of confusion, we realized I was talking to people at the food pantry in Sault Ste. 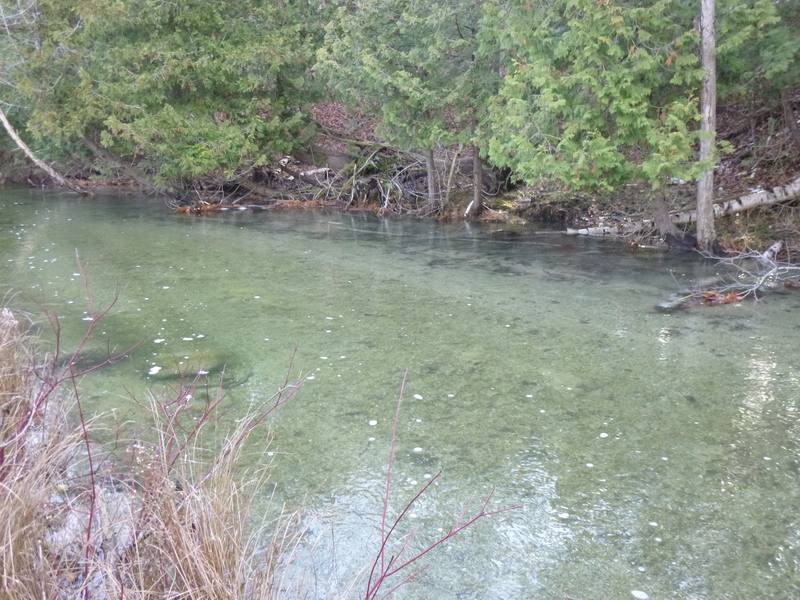 Marie, Ontario which is right across a bridge from Sault Ste. Marie, Michigan! That must get confusing for people now and then – 2 towns with the same name right next to each other, but they’re in different countries. I felt bad I couldn’t make a donation to them after all because it sounded like an interesting way to support the soup kitchen, but I needed my donation to stay in Michigan, and they understood. 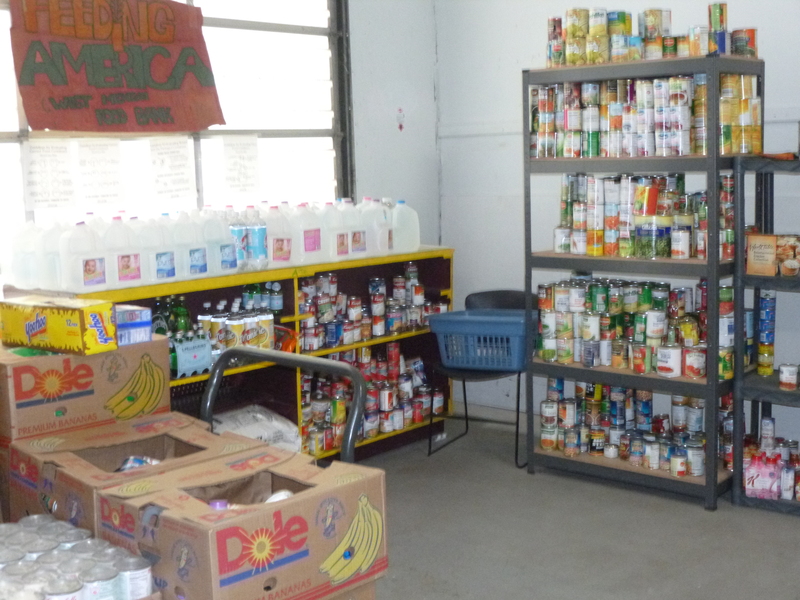 I then found the correct address for the correct food pantry in the correct country, and drove over there. 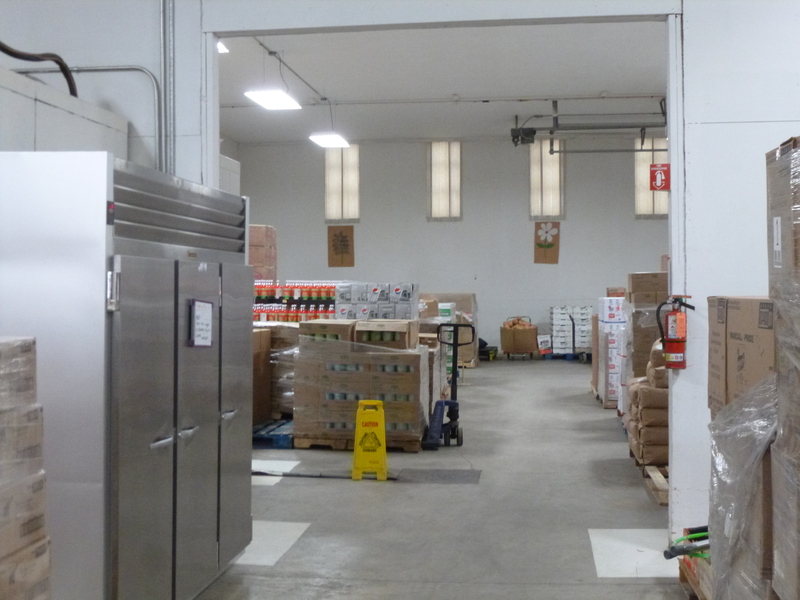 I met one of the volunteers who was sorting food, and she introduced me to Lee Ann, the manager. It was fun to talk with Lee Ann – she showed me around and told me more about the food pantry – she started as a volunteer many years ago, and is now the manager, and they help hundreds of families. She was very supportive of my journey and even gave me a little cooler with a coffee mug and a pen and a couple other things – I felt guilty getting gifts in return for a relatively small donation! It was an interesting stop, and then it was time to head out to do some walking. 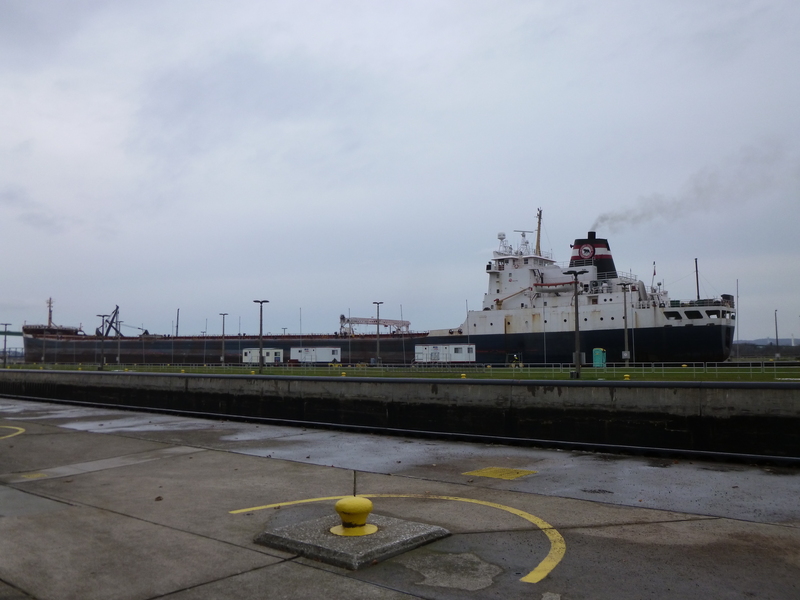 Tula and I drove down by the Soo Locks and I got her out for a mile and a half walk along the outside of the park along the locks. 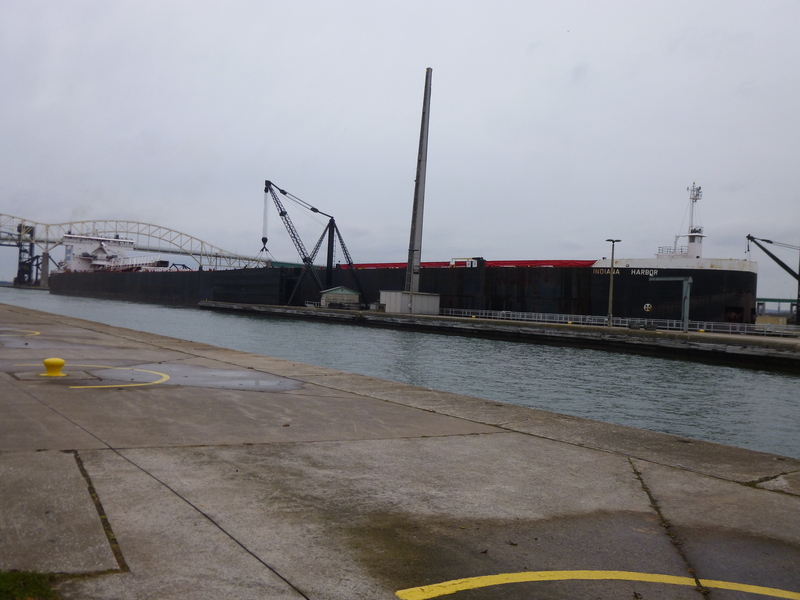 There was a freighter in the lock closest to the park, and I felt I could almost reach out and touch it. 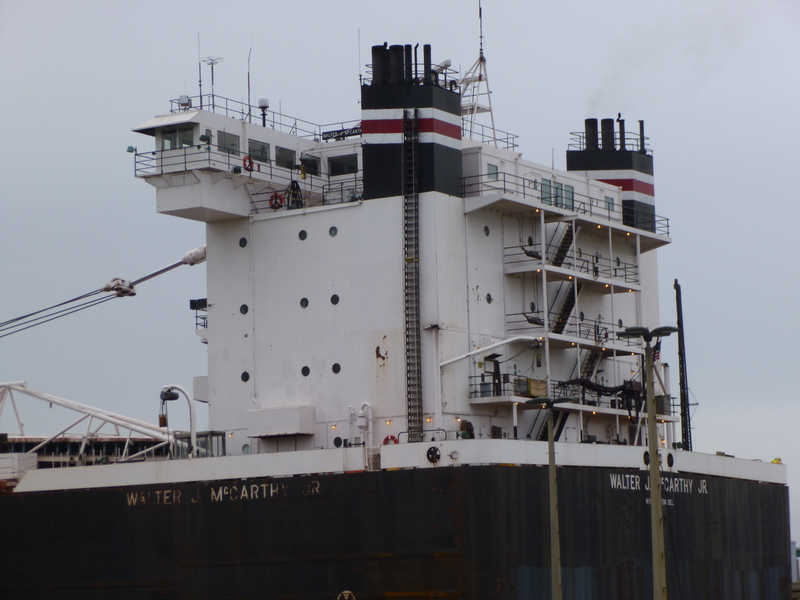 There’s a 21 foot difference in the level of the lakes, and it’s fun to just watch the freighters rise out of the water. 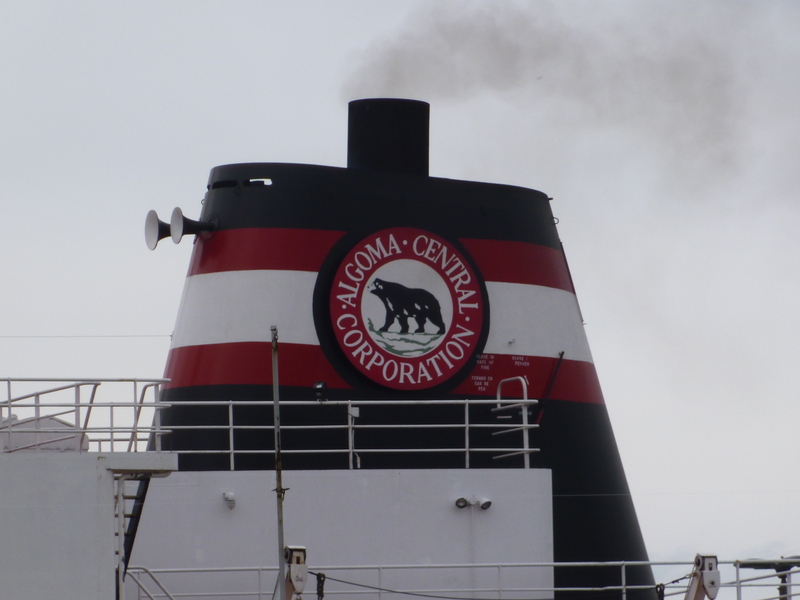 At first glance, the ship didn’t look as big as it was because the most visible part of it was the white “tower” where most of the activity seems to take place. 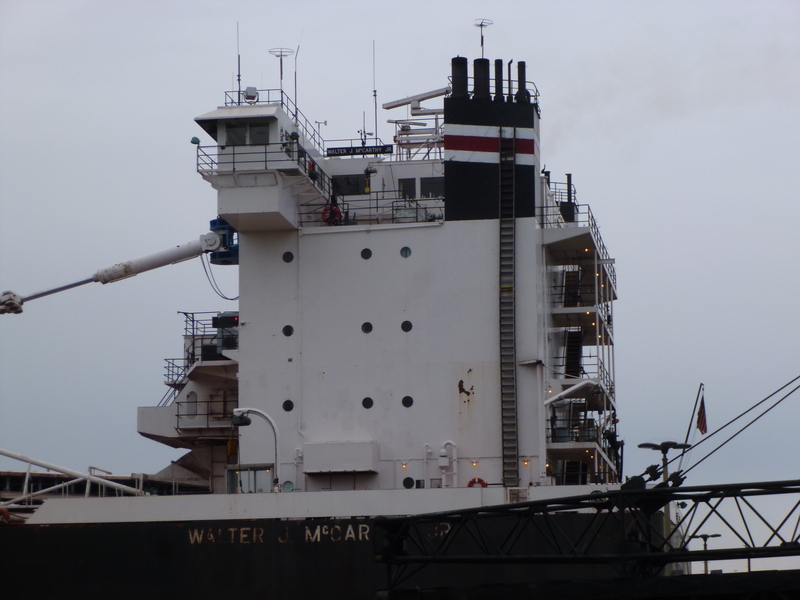 And then as the freighter rose, I could see the massive bulk of the rest of it – they’re soooo long. 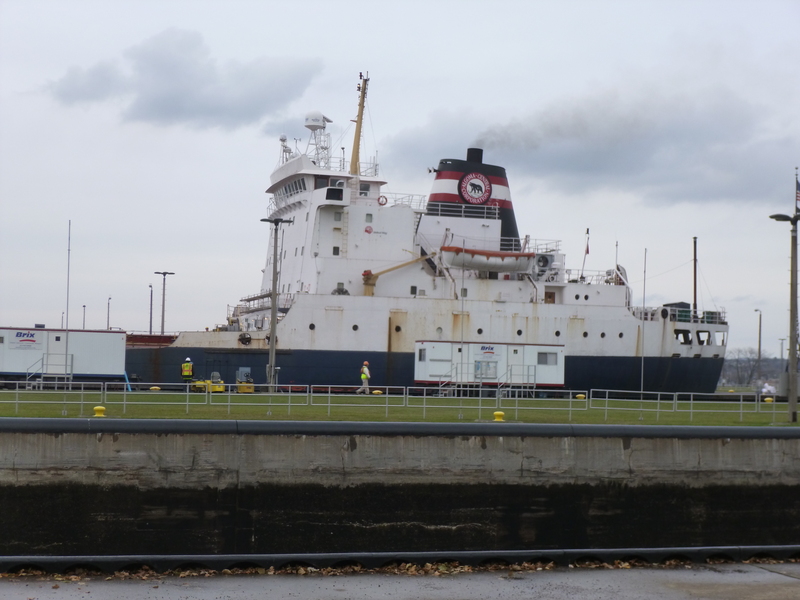 It’s a wonder they fit in the locks – there’s barely any room to spare on either side of the ship. It doesn’t take all that long for a ship to rise or fall, and then with a blast of the horn, they begin to glide out, with hardly any noise. 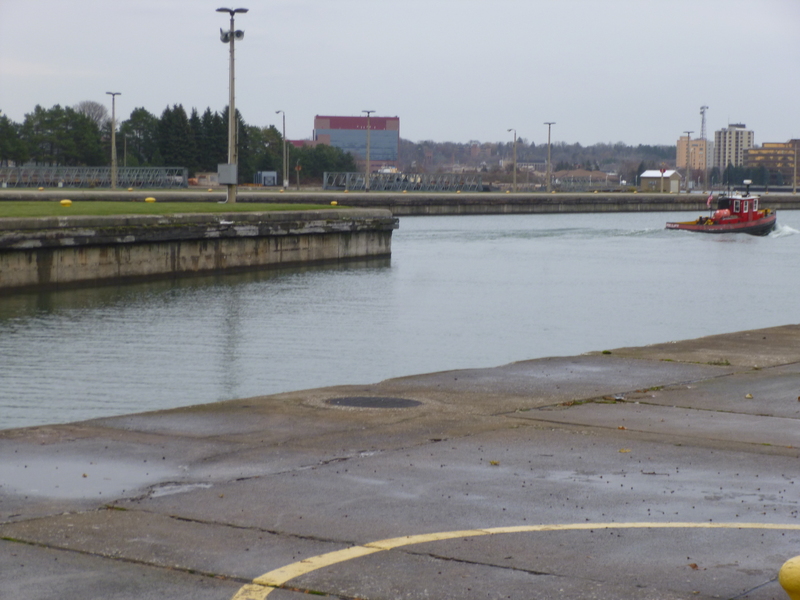 It was a cold day and I put Tula back in the car, and then went inside the park right next to the locks. 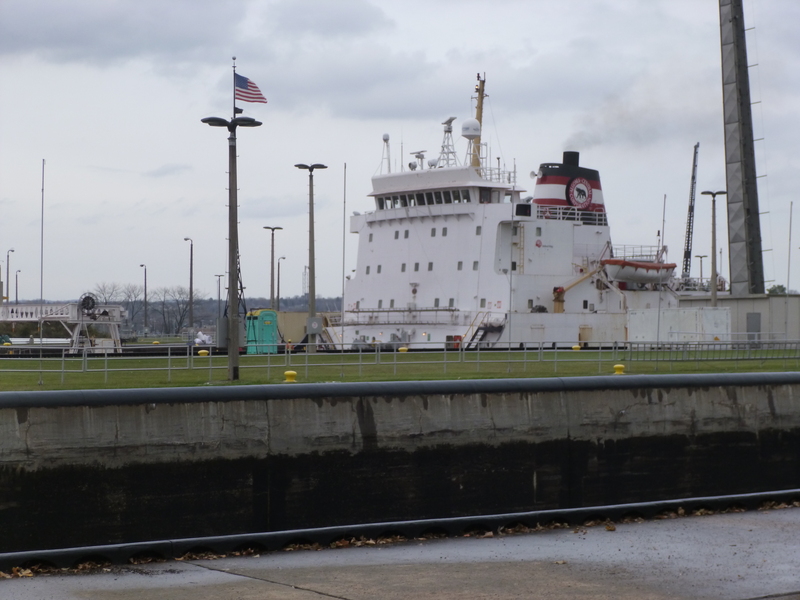 Since this was the off season, the visitor center was closed, but I still walked all around, and from one end of the lock system to the other, and watched a couple other freighters go through the locks. There are 4 locks and they can be used simultaneously. 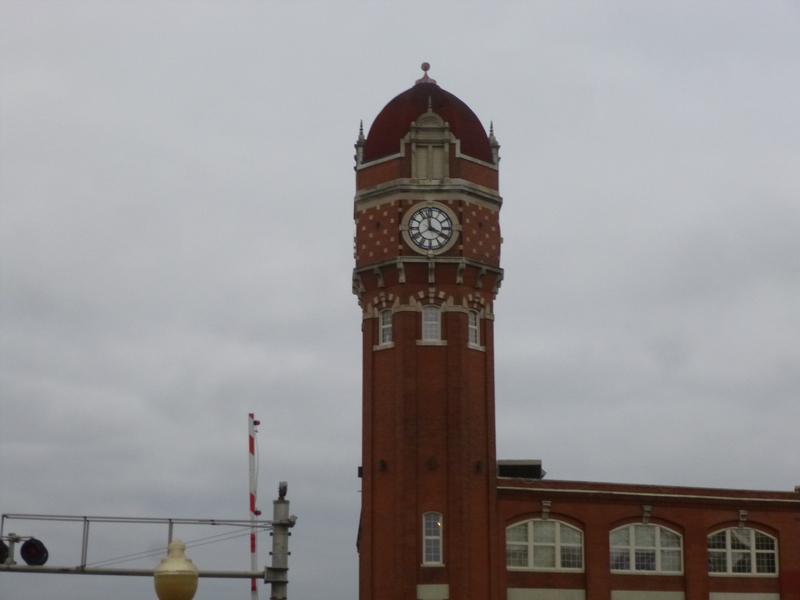 I walked through the downtown area too, which was pretty quiet on a cold November day, and covered almost 3 more miles. 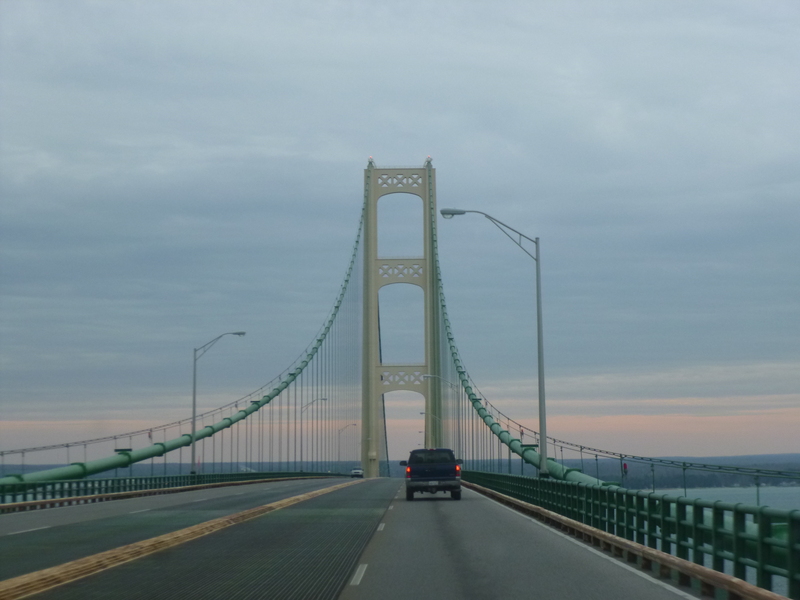 Then it was time to head south, and after a while I crossed the Mackinac Bridge back into the lower peninsula of Michigan, which I had left 440 days ago. 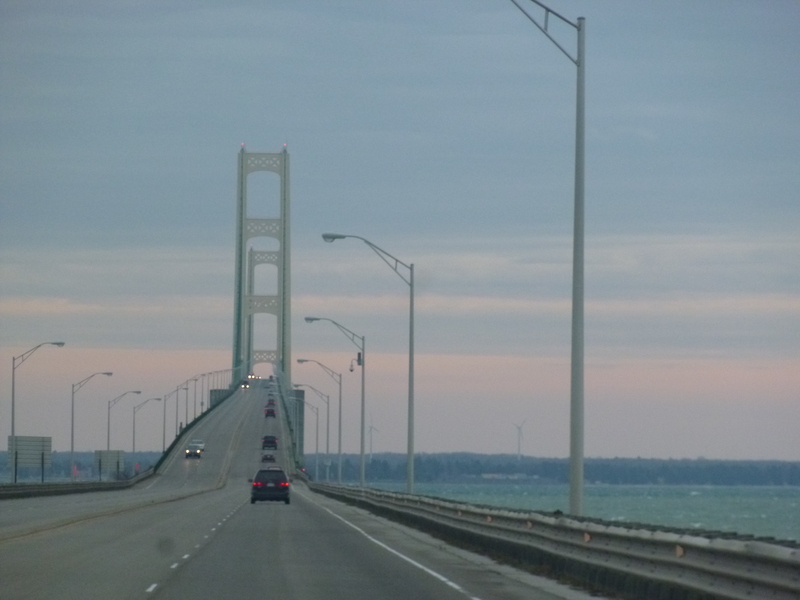 I’ve crossed the Mackinac Bridge countless times, and I always admire the view! Tula and I got out to walk by the lighthouse on the Mackinac City Historical Pathway along the shore. 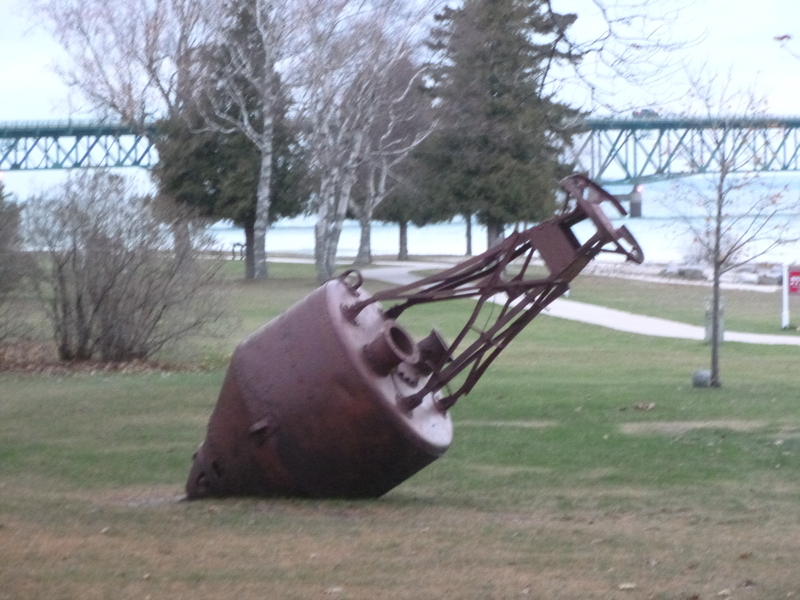 Then I walked another couple of miles in a very deserted Mackinac City. In the summer the town is literally crawling with shoulder-to-shoulder people and one can hardly drive a car down the street, but at this time of the year most of the shops were closed and only a couple restaurants and hotels were open. I’m pretty sure one of the ferries continues to make a daily run to Mackinac Island though. It still amazes me that these seasonal towns can stay alive with only the summer tourist season to support them. 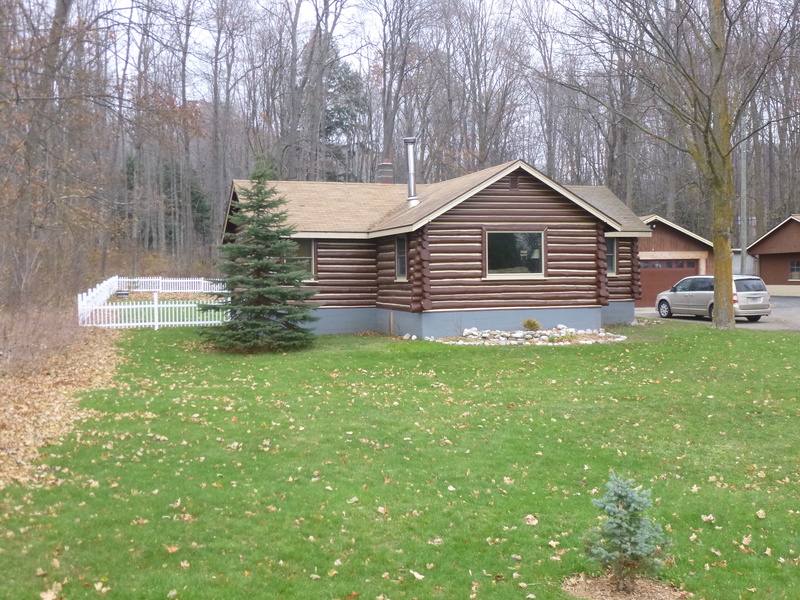 Then I headed to Petoskey where I met up with my daughter Taryn and she led me to her new home – a cute little log cabin in Walloon Lake that she and her boyfriend Jared bought last summer. Taryn was just getting off work, and Jared had the day off, so he had a yummy venison dinner waiting, and we enjoyed the evening in the cozy cabin. 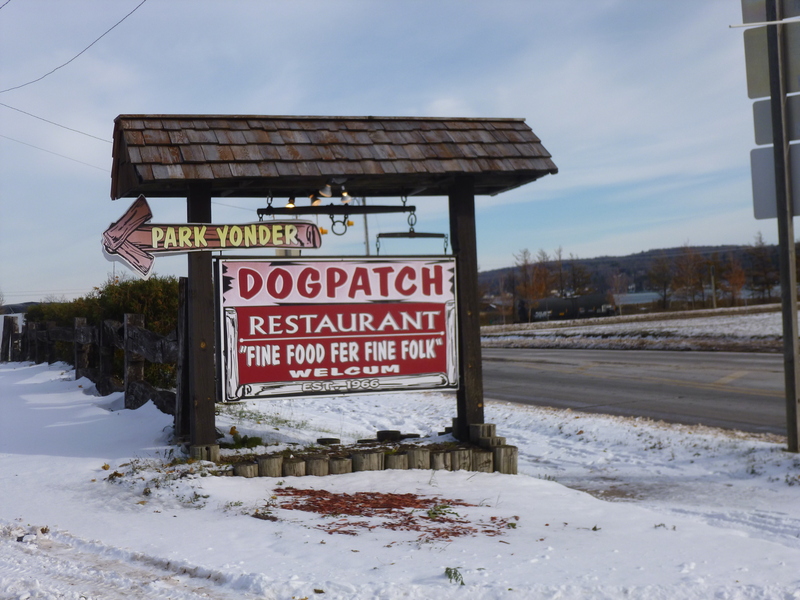 I fueled up with a good breakfast at the Dogpatch since I wouldn’t be in much civilization for a lot of the day, then Tula and I took a mile and a half walk around the town of Munising on icy sidewalks – the ice and snow slow me down, but doesn’t stop me! 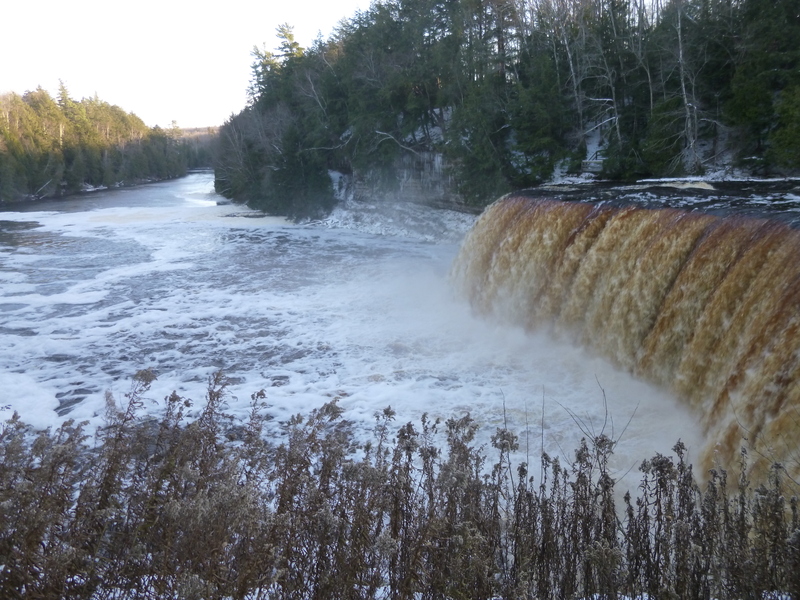 Then we began the ride through the wilderness of the central upper peninsula – through the Seney stretch and past national wildlife refuges and little towns that weren’t much more than a junction of two roads. 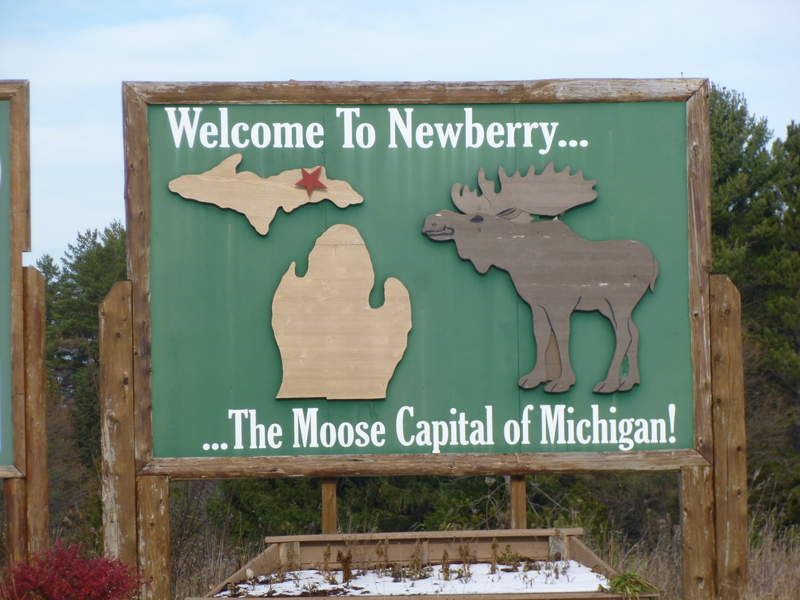 I headed north through the town of Newberry – the moose capital of Michigan. Newberry was a little bigger than I expected, and we got out to stretch and walk a mile and a half. 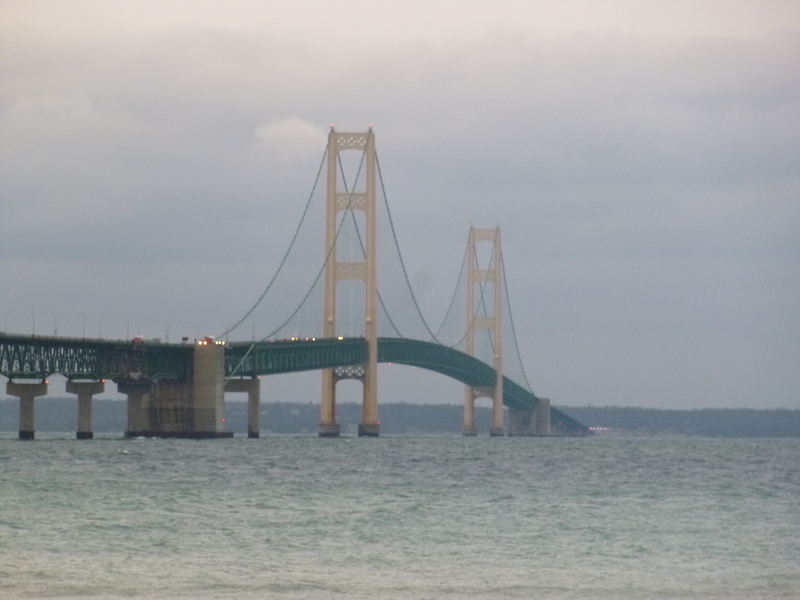 I started out my Michigan week of donations ahead of the game – back in August 2012 before I actually left on my journey, I made 2 Michigan donations to kick off the whole expedition. I have the best neighbors anyone could want, and 2 families are looking after my house, yard, horse and mail, and they both have college-age students who are very involved in extra-curricular groups, and I wanted to support those organizations – it seemed to be an appropriate way to kick off the donations since their families were going to be helping me so much. So the first donation went to the flag team at Eastern Michigan University since they were holding their annual Winter Guard Fundraiser a short time before I left, and the other donation went to Crossbow – a talented group of musicians at Grand Valley State University who specialize in Celtic music, and they are invited to perform at numerous events around the state, and my donation went toward gas money for them. I liked being able to make my first donations in Michigan, and my last donations will also be in Michigan. 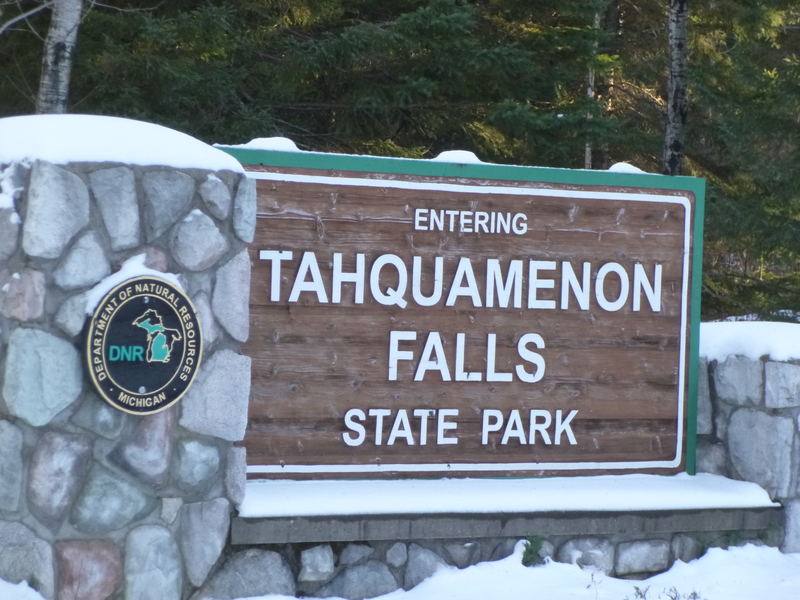 Then I continued north to Tahquamenon Falls, which I hadn’t seen for decades. 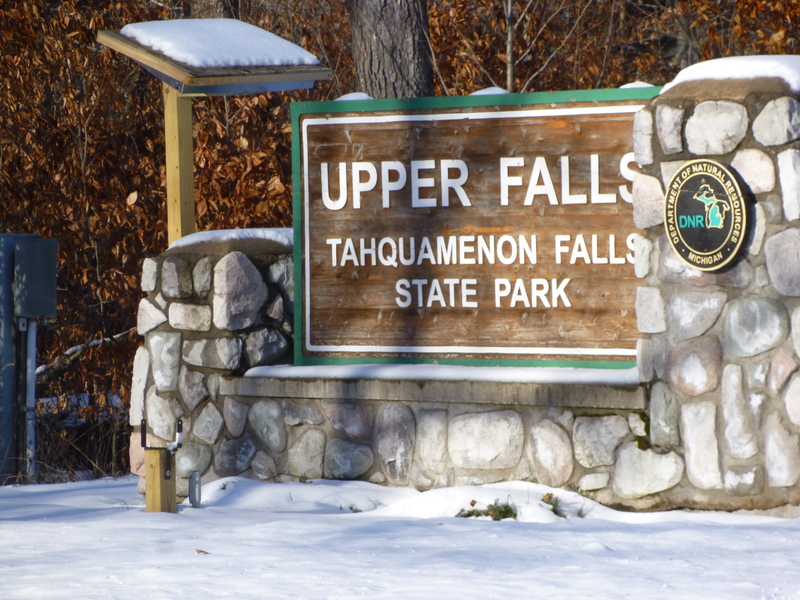 I found the State Park, and Tula and I set off for a snowy walk to see the Upper Falls, which are the most scenic ones. 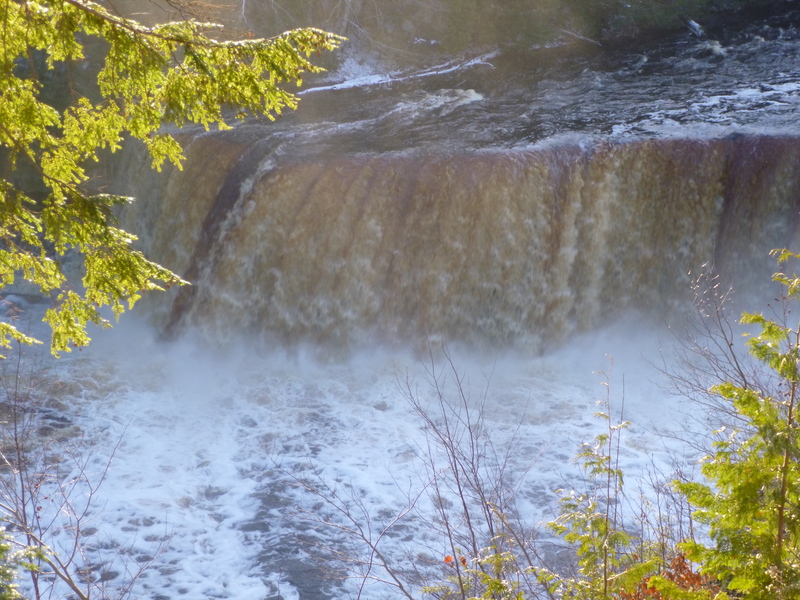 The sun was shining so brightly in my eyes that it was hard to get a clear head-on picture of the falls. 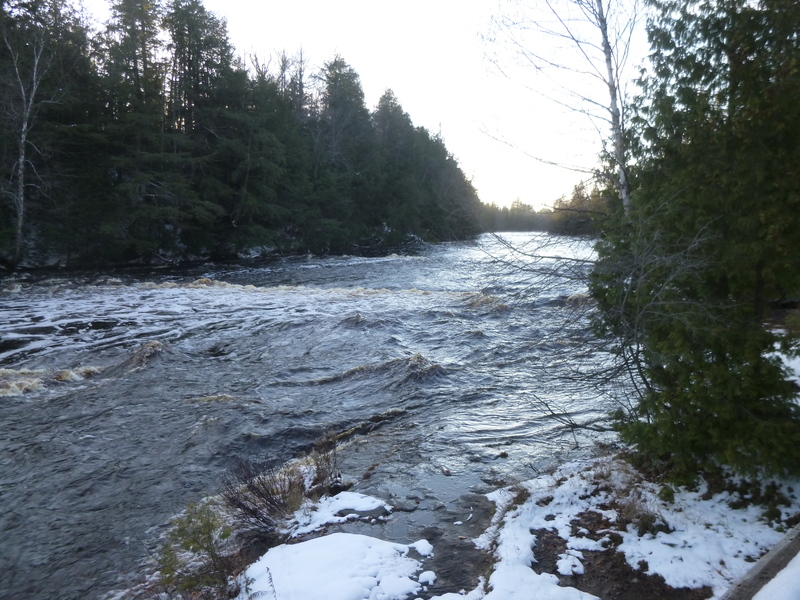 So I continued walking along the path to descend to the brink of the falls. 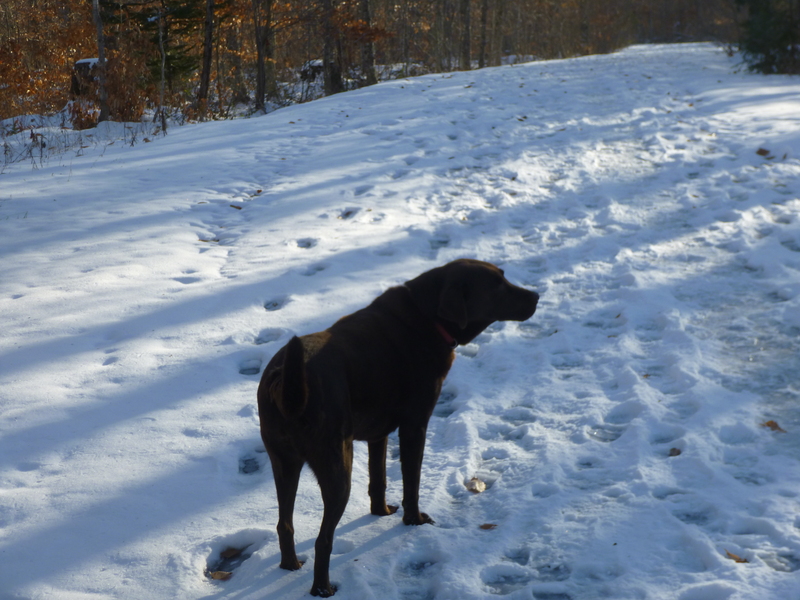 But the stairs were open-grid metal and Tula was afraid to go down them, so I walked her back to the car, and returned. The steps took me down so close that I could feel the mist of the falls. 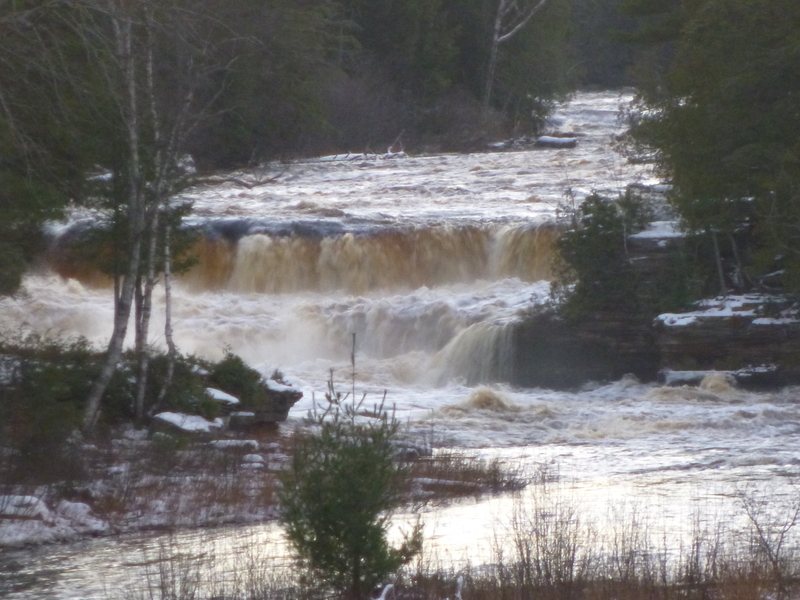 The water was flowing fast and the falls absolutely thundered over the precipice. It’s very mesmerizing to just stare at them and lose myself in the cascading water -almost hypnotic! 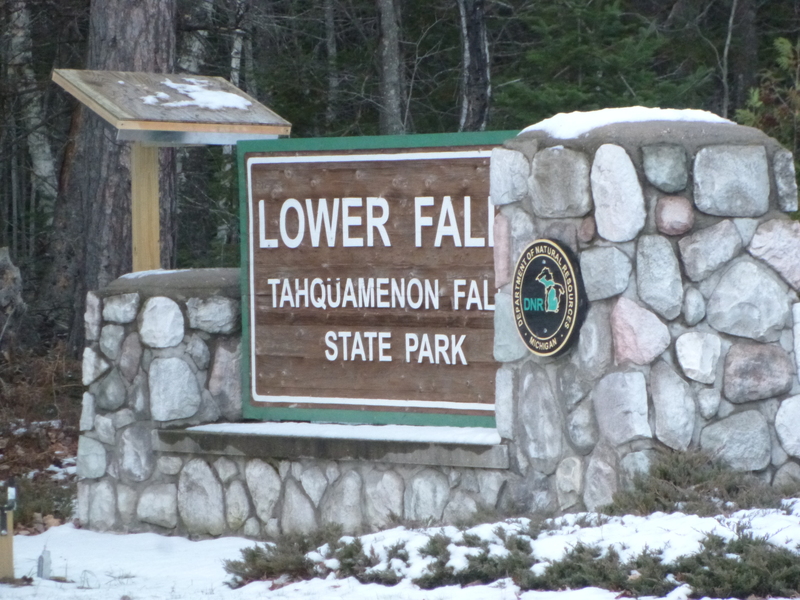 After I had soaked up as much of the falls as I wanted, I headed back to the car and drove over to the Lower Falls area. 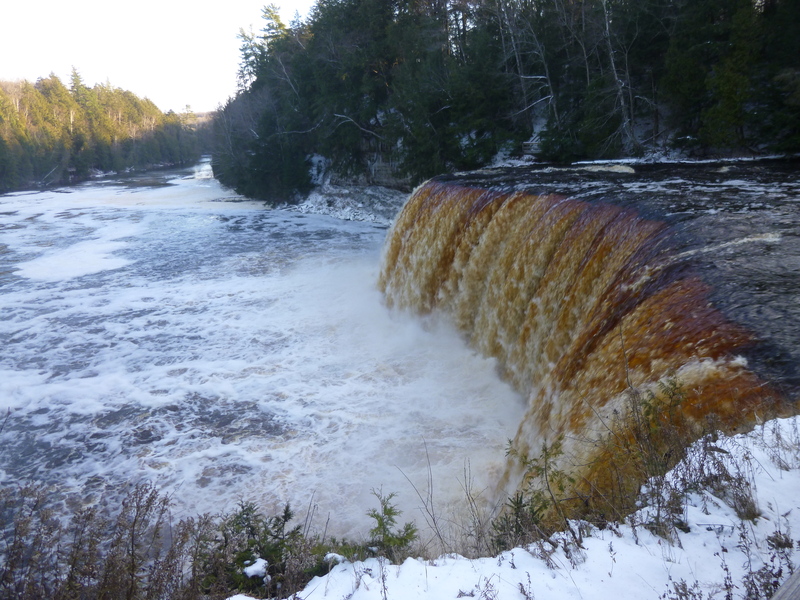 The road was closed down to those falls, so I got out and walked quite a ways to see them. 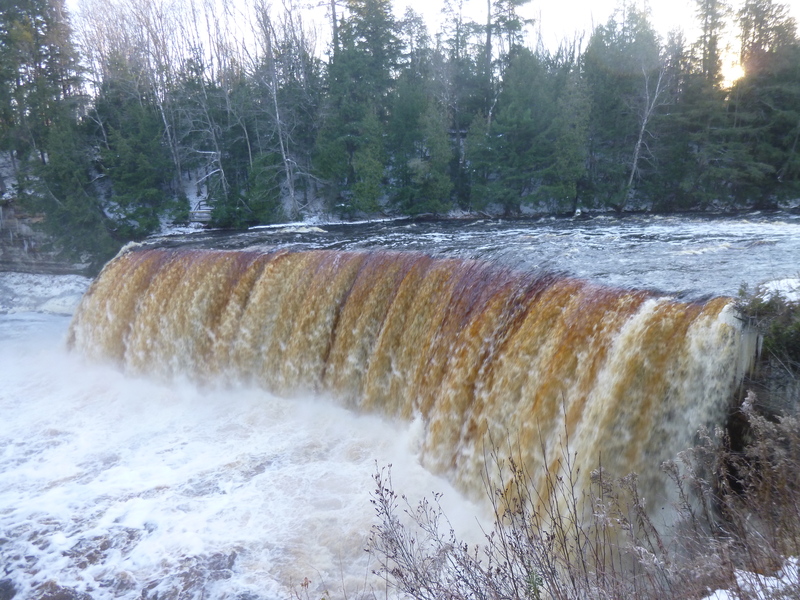 In my opinion, they’re not nearly as spectacular as the Upper Falls, but it was still worth the walk to go see them. 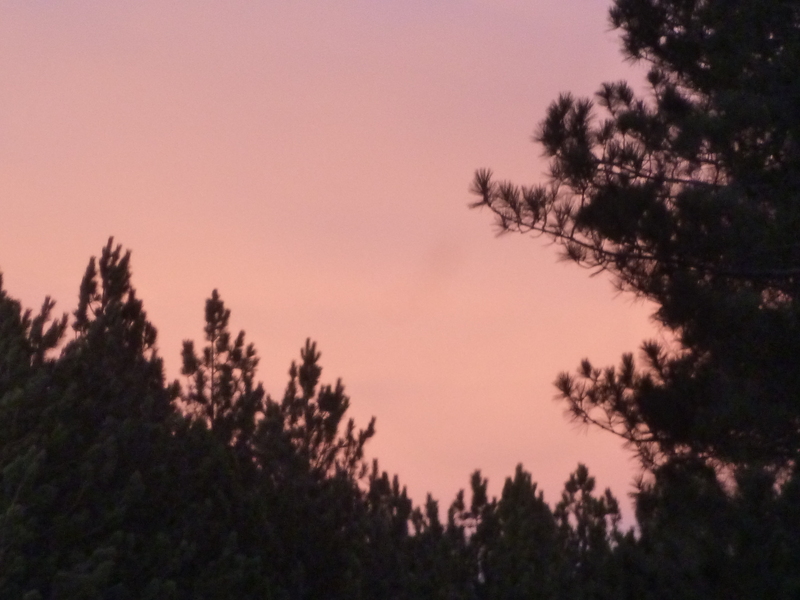 The sun was falling lower in the sky as I walked back to the car along the snowy lane, with lots of pine trees and pink sky looming overhead. 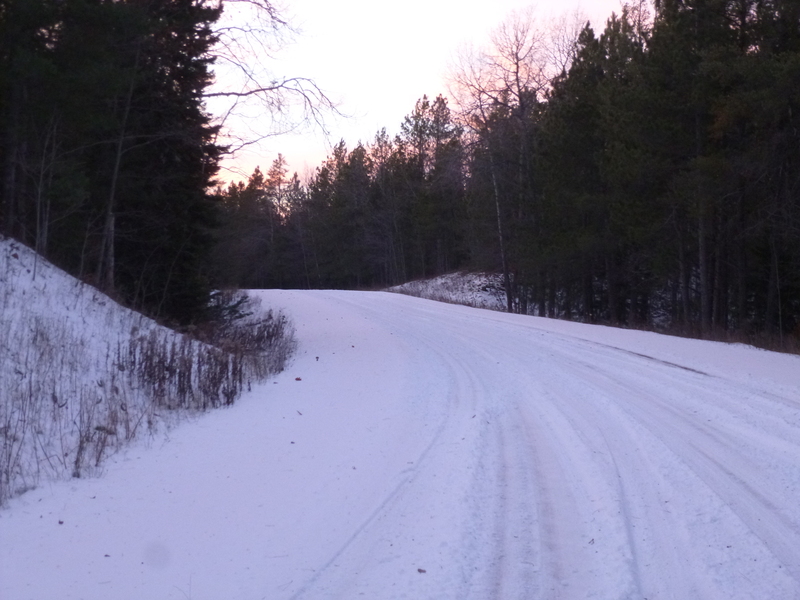 I drove to the little town of Paradise, which was pretty small and quiet this time of year. 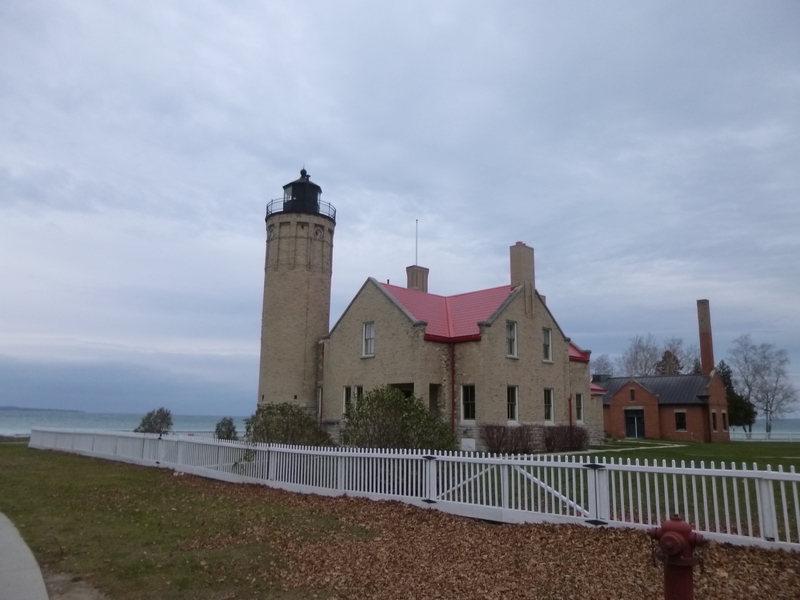 The light was fading and I was tempted to make the drive up to see the lighthouse at Whitefish Bay Point, but I thought it would be too dark. 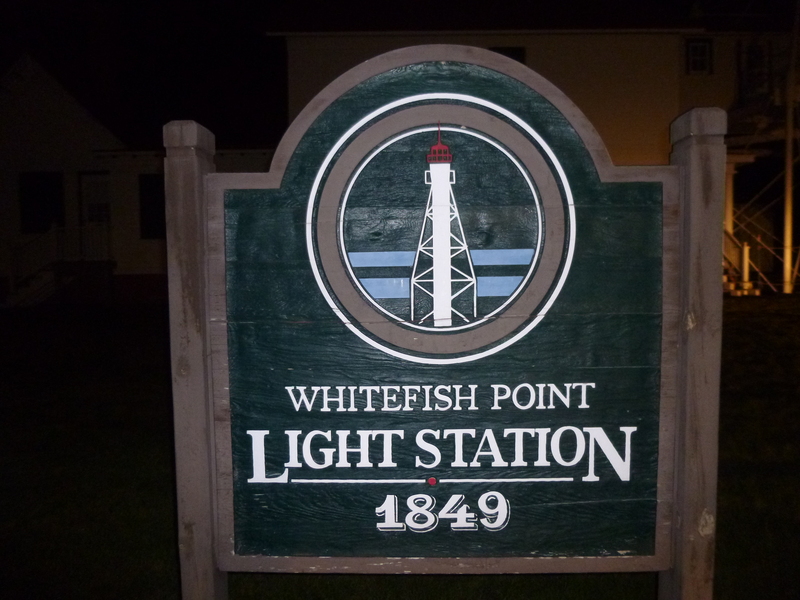 Then one of my daughters called and I began to lose cell phone service so I turned around to stay in Paradise while I was on the phone, and then I decided to make the drive up to Whitefish Point in the moonlight. My daughter had been telling me about their old dog, whose days are sadly coming to an end, and while I was talking with her, I got a text from my friends next door who had just put down one of their dogs earlier in the day, and it was very sad – thinking about my daughter’s dog, and hearing about my friends’ dog, and I decided the pretty stretch of road between Paradise and Whitefish Point would be a good memorial drive for all beloved dogs, and in particular for my friends’ dog Sugar. When I got up to Whitefish Point, the lighthouse and a couple outbuildings looked kind of ghostly in the moonlight, but the light was faithfully beaming out over the water, and it was very peaceful. There’s an old shipwreck museum there (that isn’t open in the winter) and that would be interesting to visit some day. 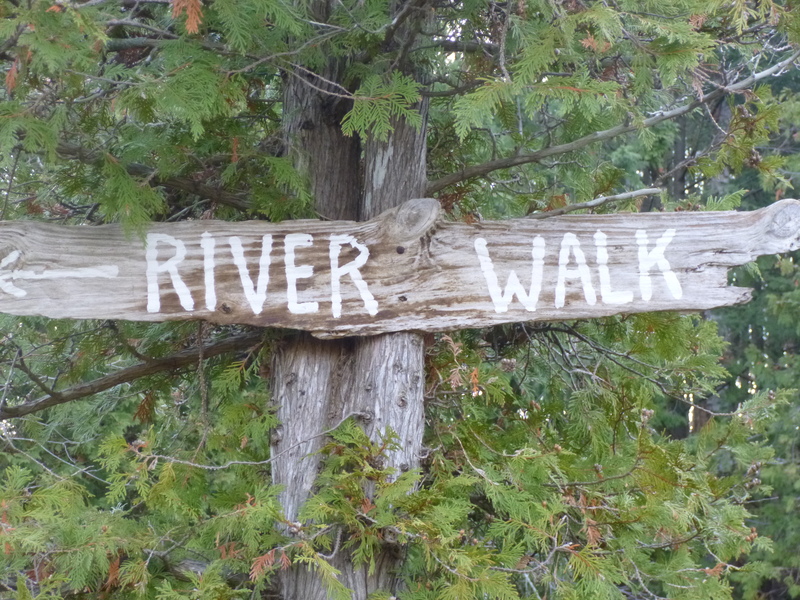 Then I retraced my steps back to Paradise, and continued around the bay to Sault Ste. Marie, where I stopped for the night.